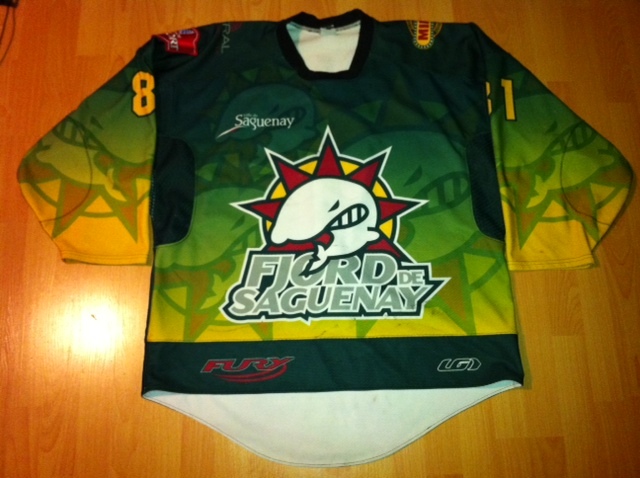 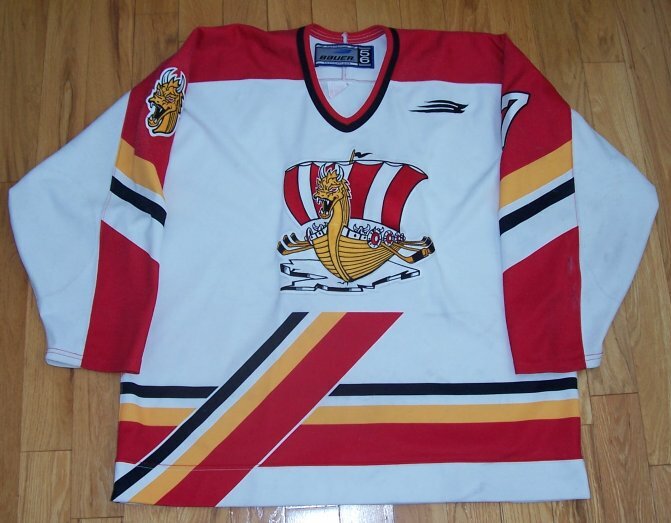 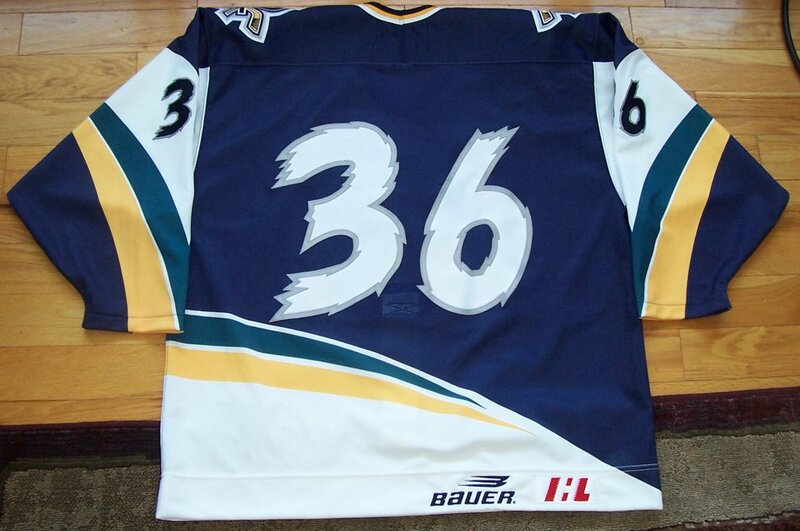 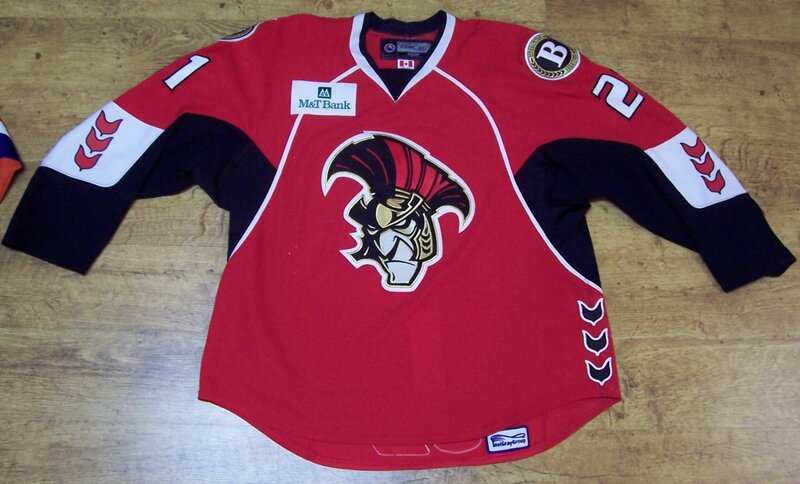 Made by Bauer, This size 56 hockey jersey comes from the Baie-Comeau Drakkar of the QJMHL. 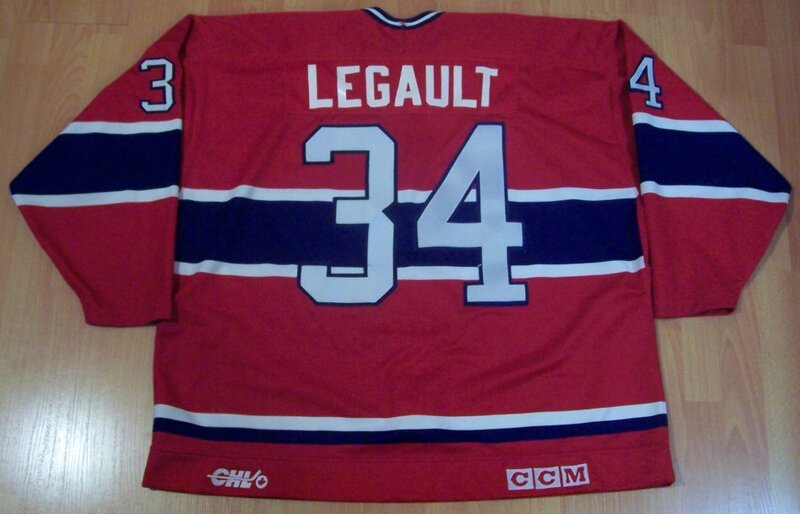 I got this from Cartes and Timbres Ste-Foy through E-bay. 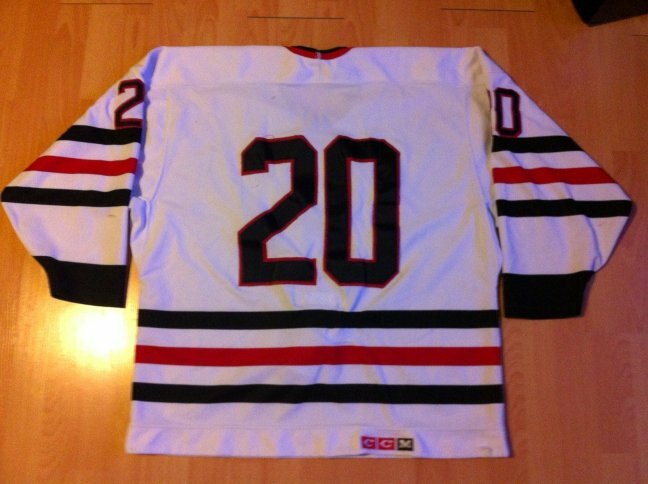 There are some stick marks, lots of pilling and a few repairs. 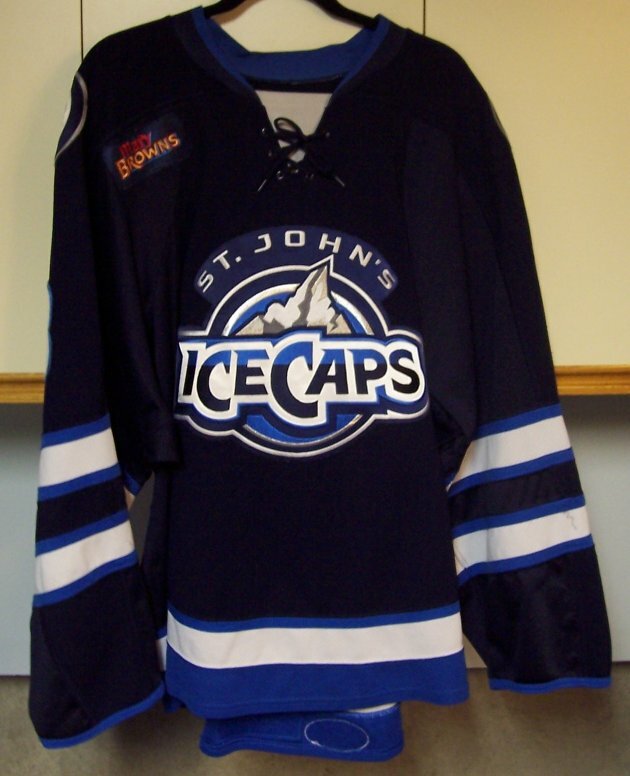 I think it is one of the nicest logo and team name in all of hockey. 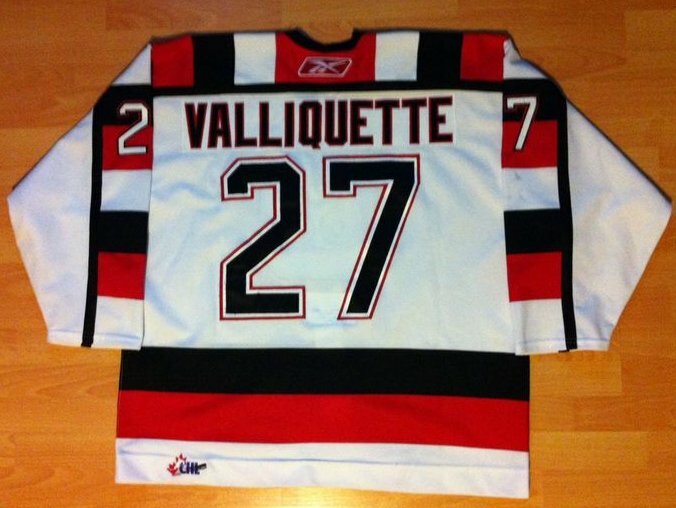 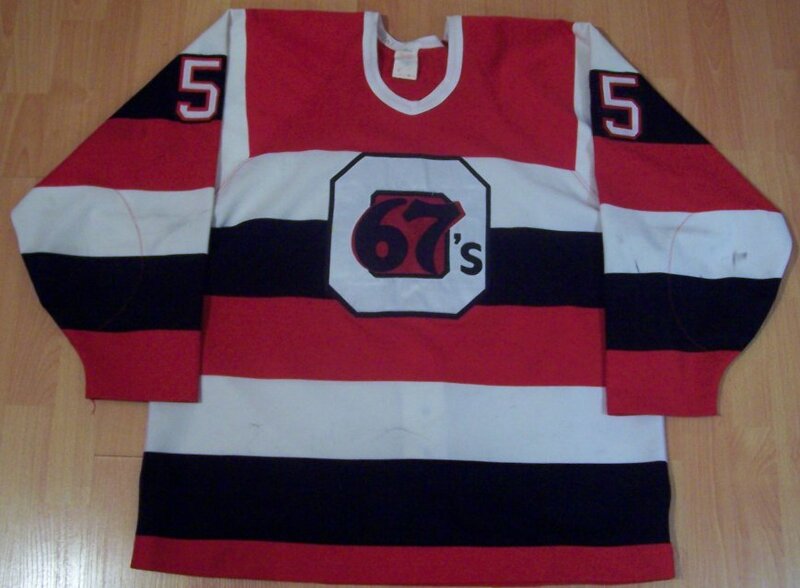 Made by Nike, This size 56 hockey jersey comes from the Drummondville Voltigeurs of the QJMHL. 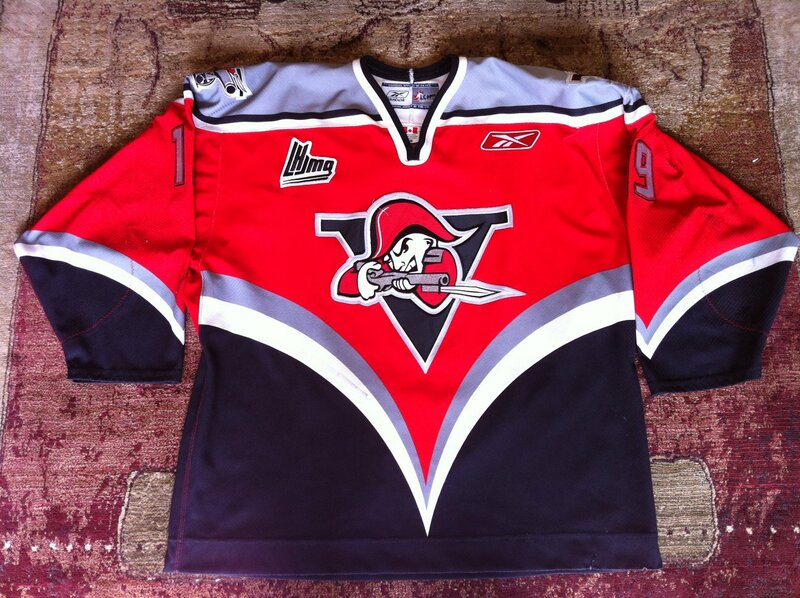 I got this directly from The Voltigeurs (Thanks John!). 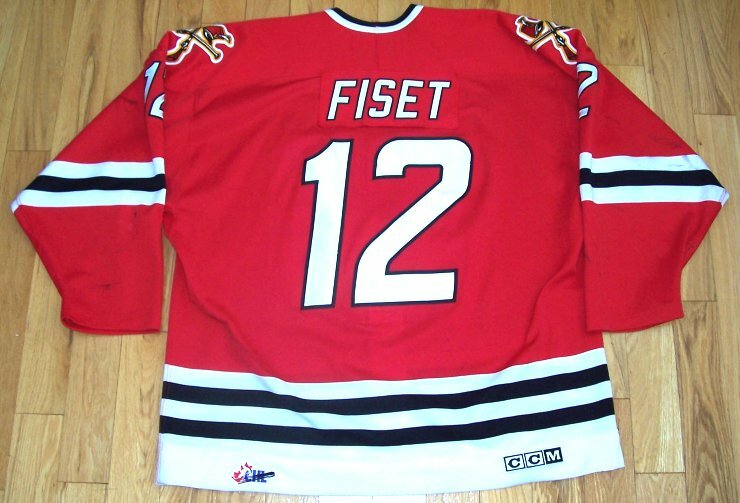 Dominic Fiset is a FIGHTER! 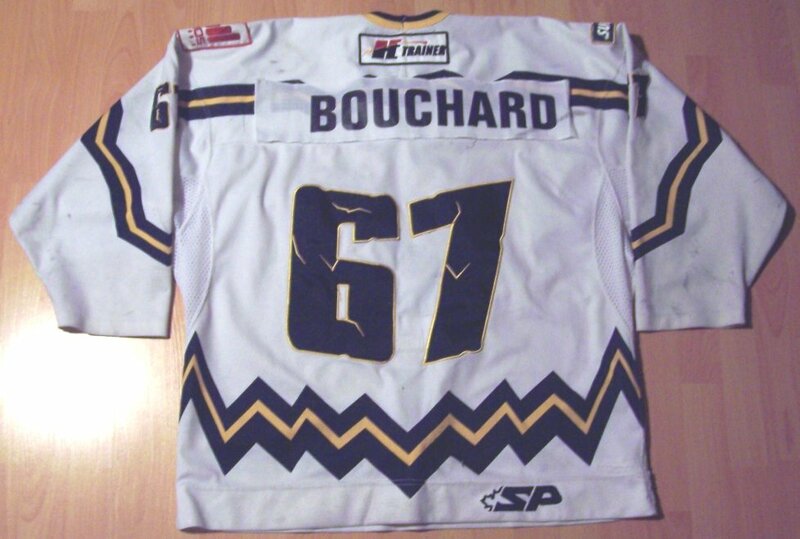 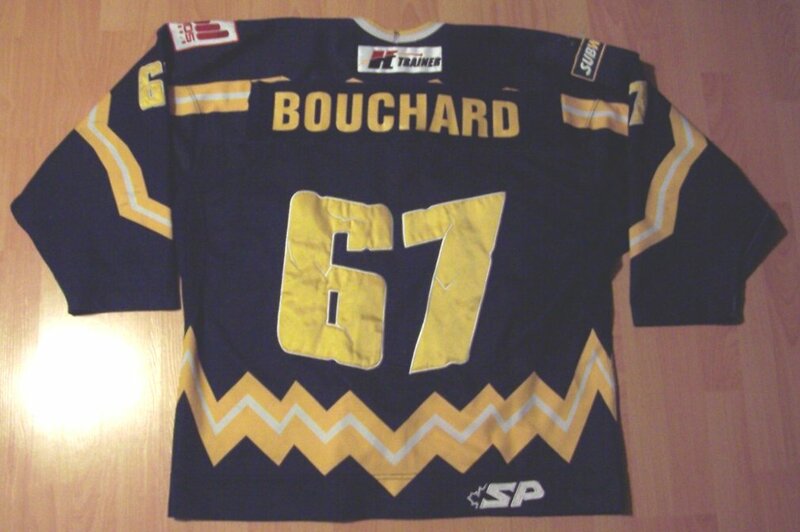 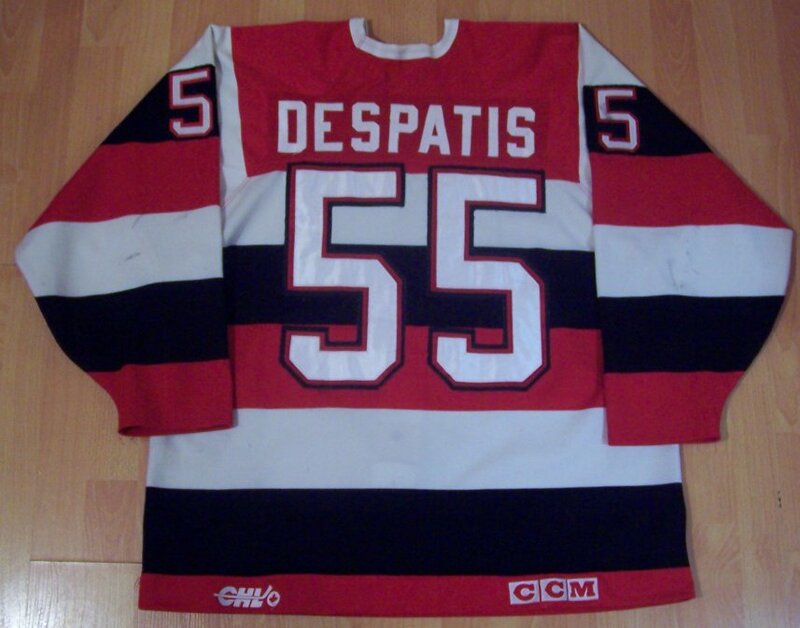 His stats were: 58gp, 2g, 7a (9pts) and a whopping 372 PIM!!! 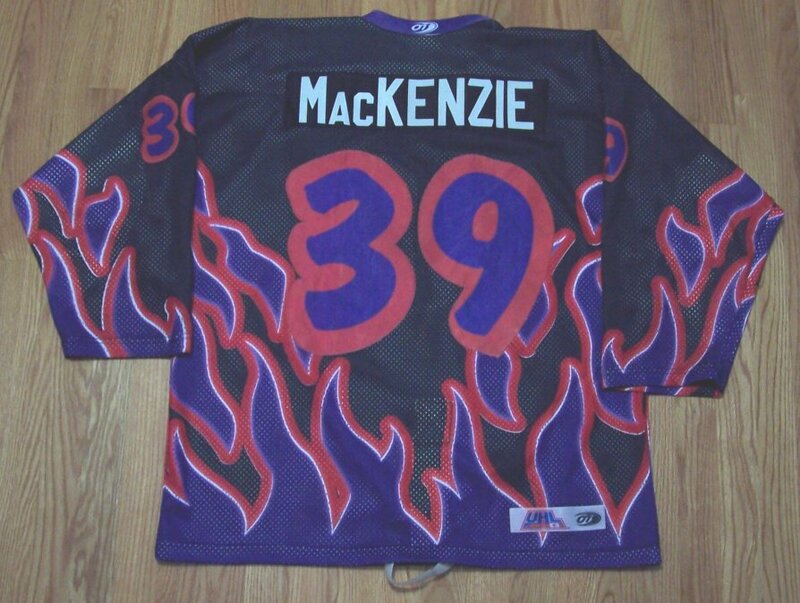 He was also suspended 8 games during that season. 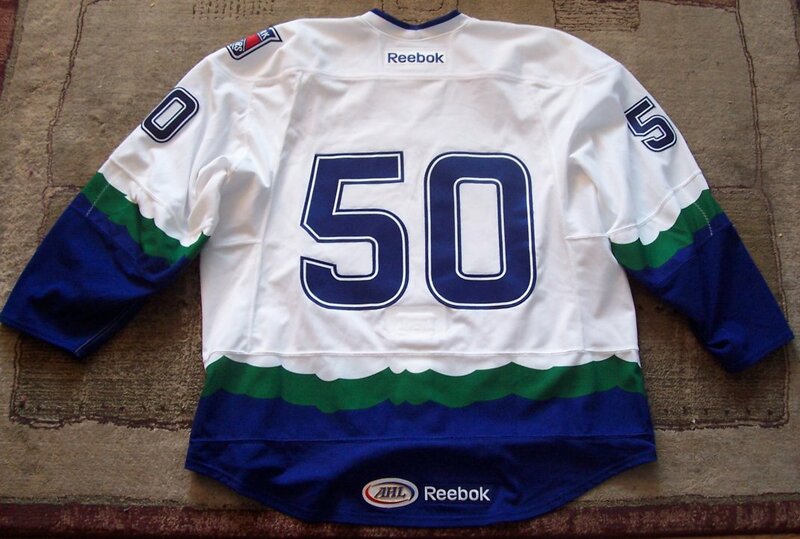 Everything is sewn on. 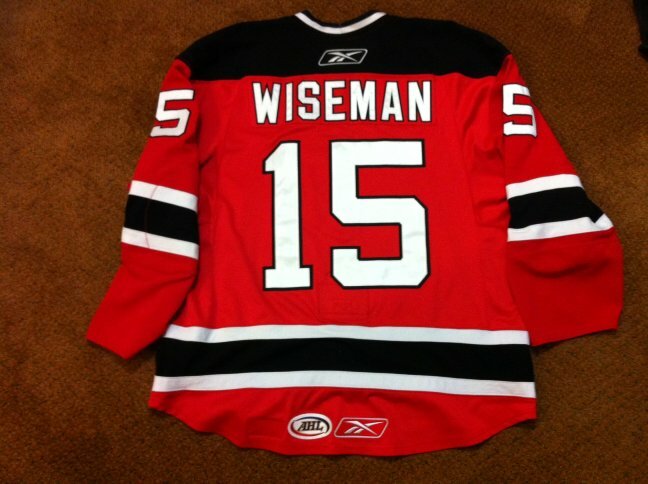 The Nameplate has been re-attached. 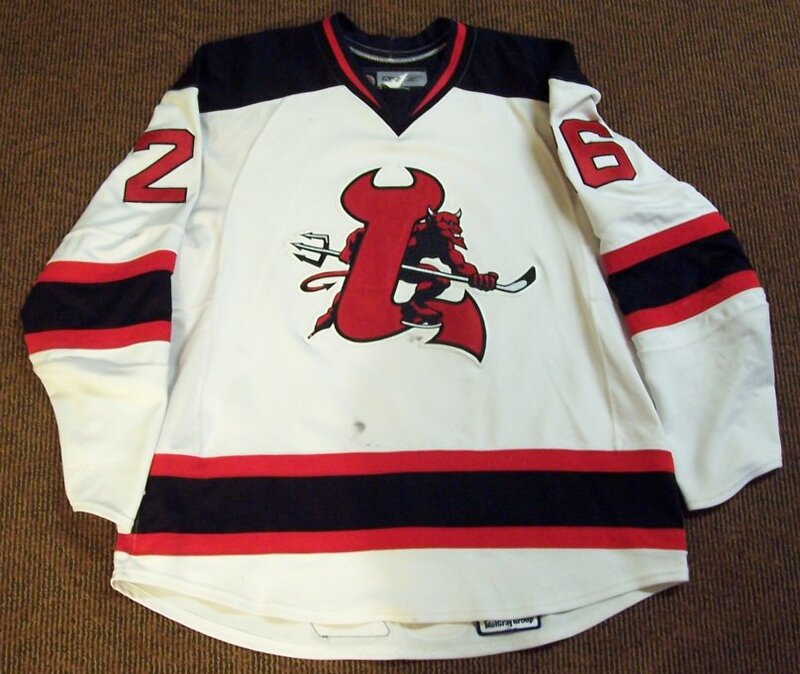 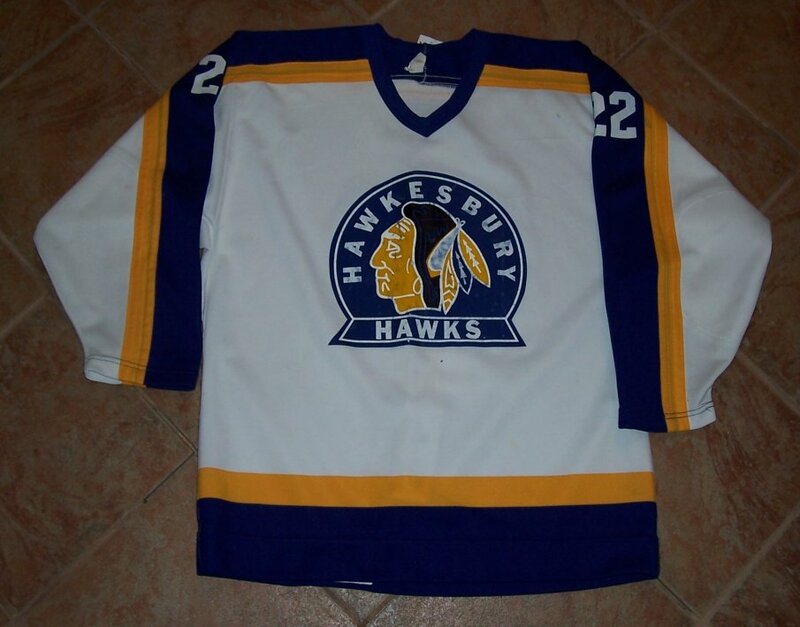 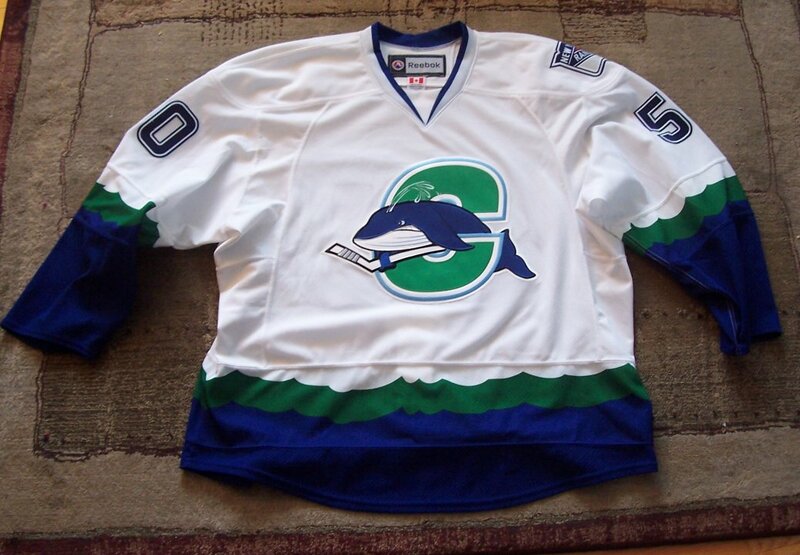 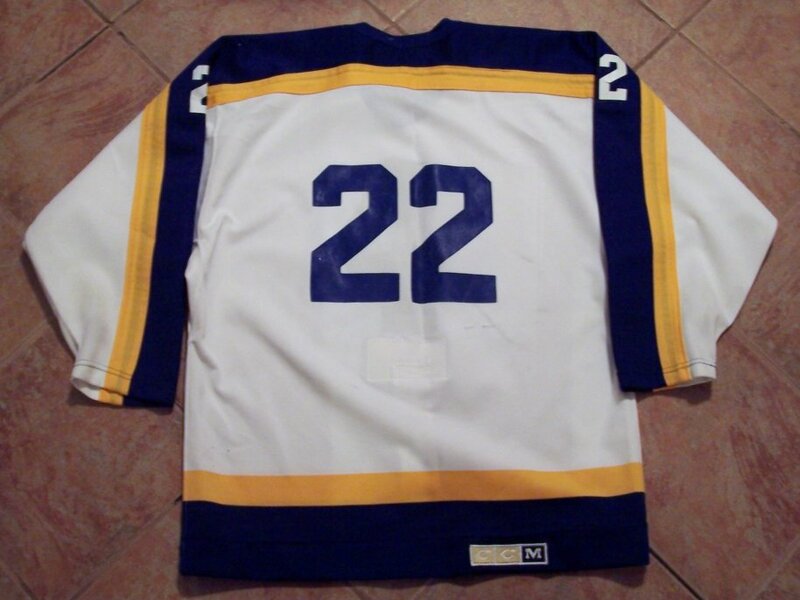 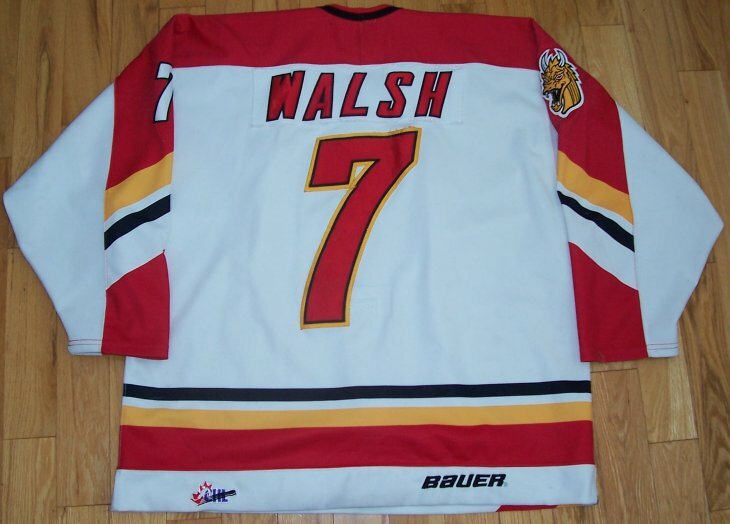 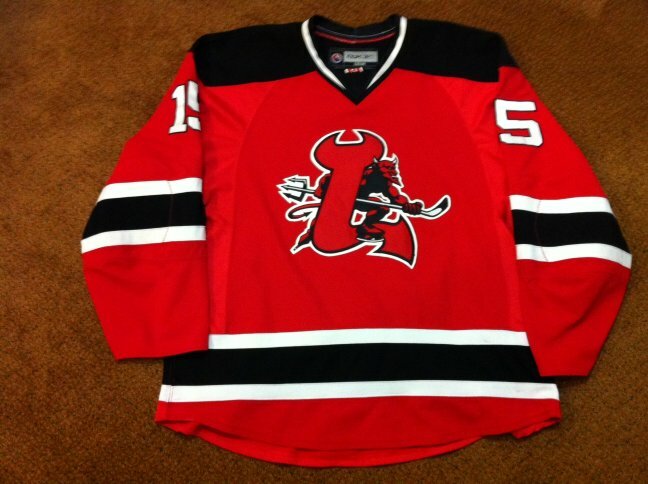 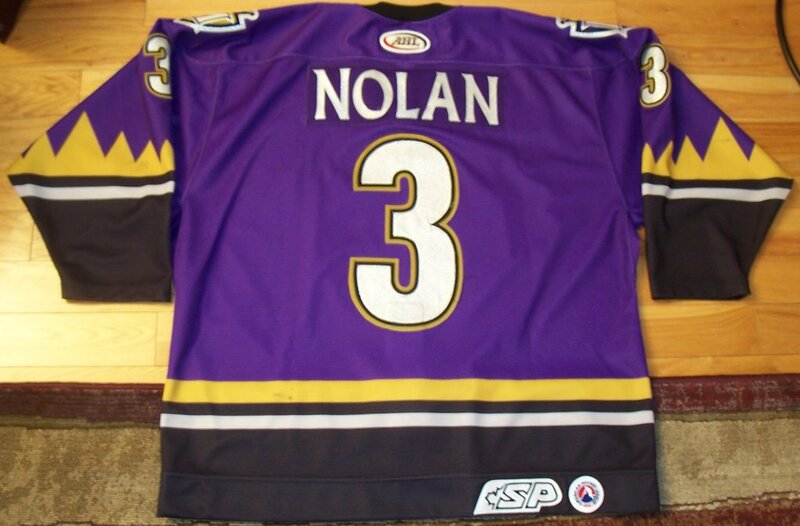 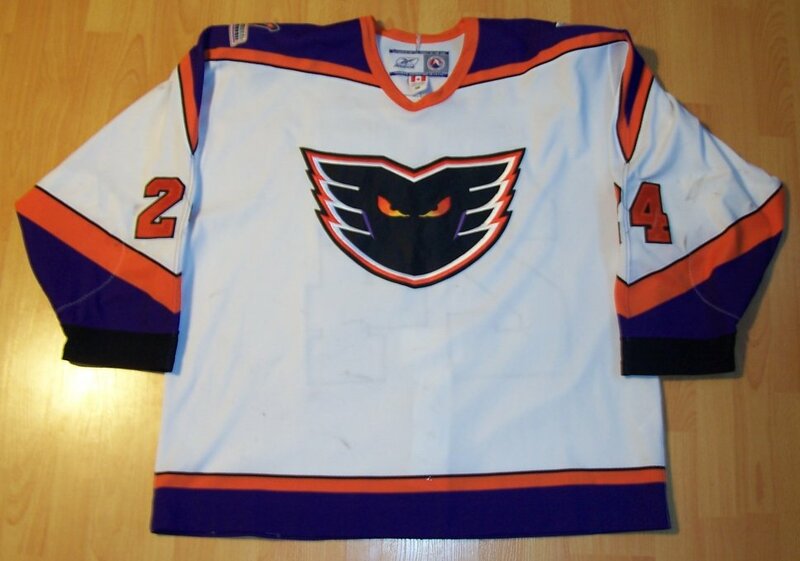 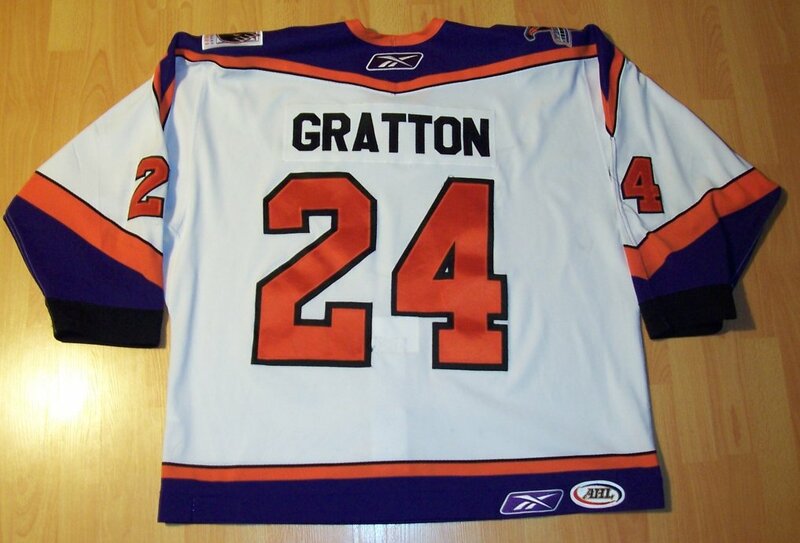 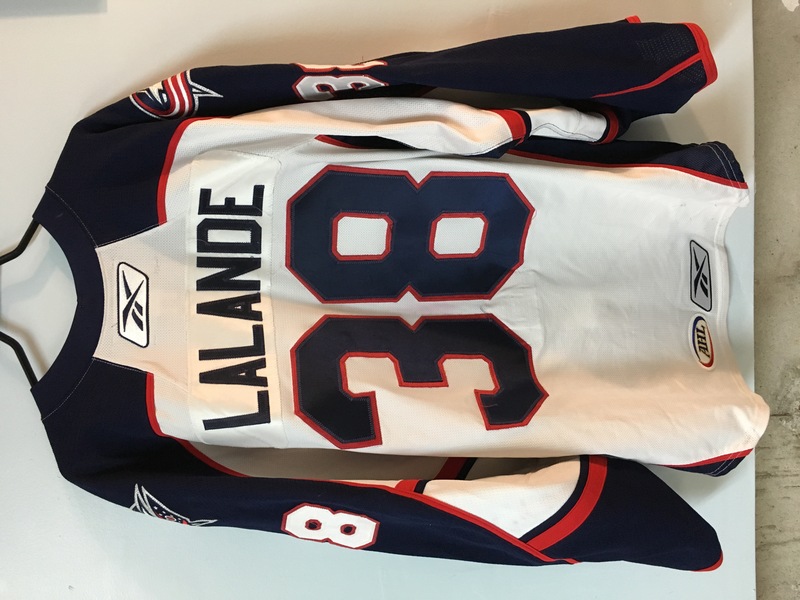 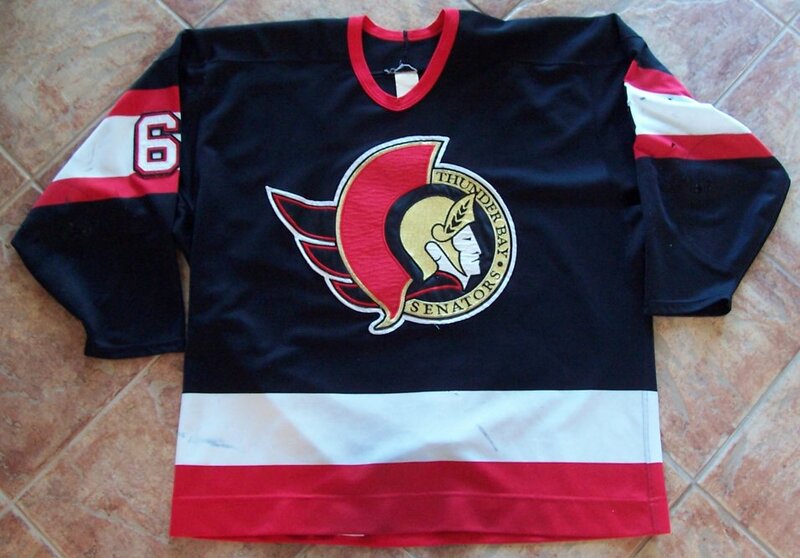 There is some velcro on the front to attach the "A" as he was an alternate capt. 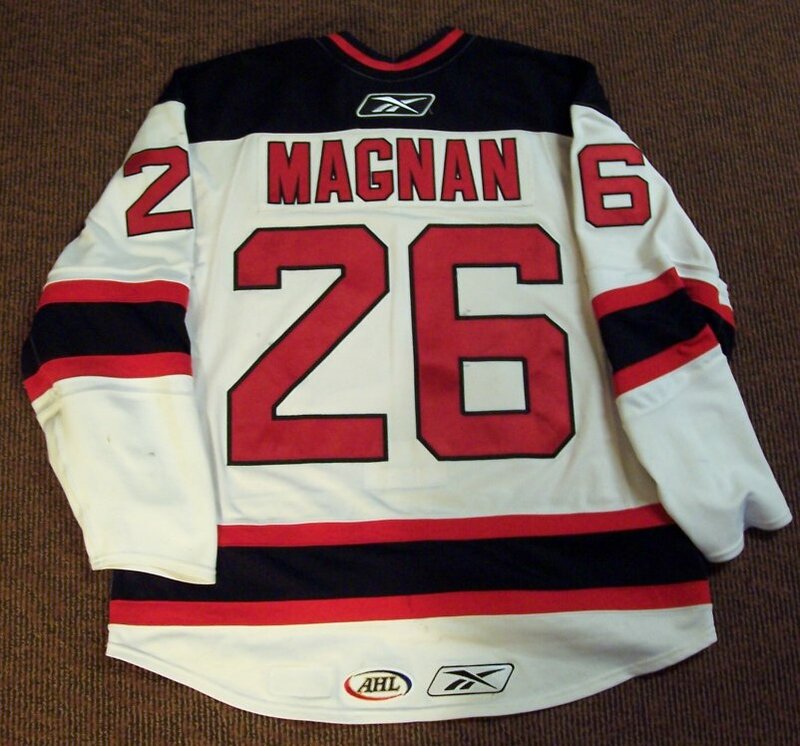 There are lots of stick/board marks, some of pilling....great use all around! 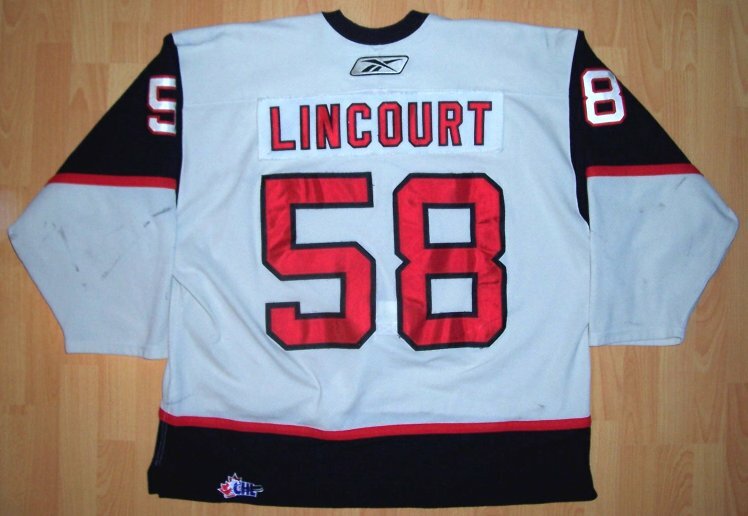 for training camp, they had to cover the Nike logos. 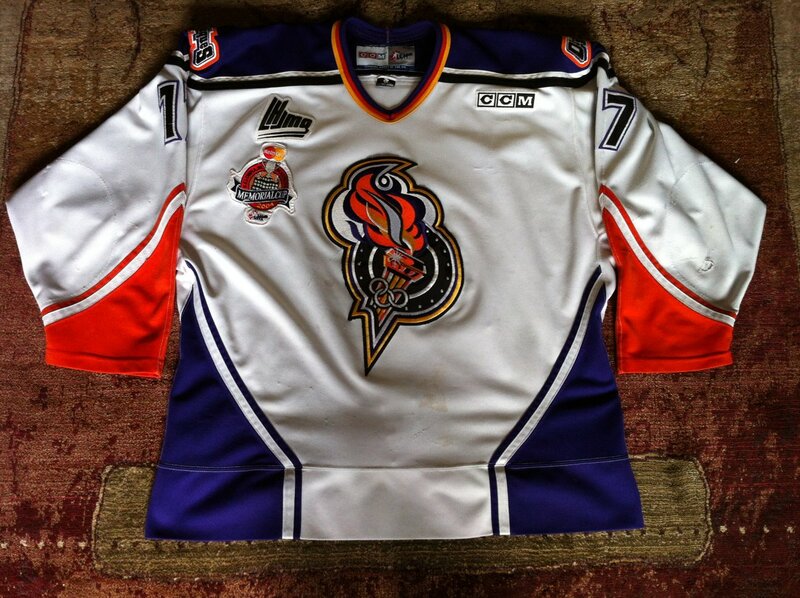 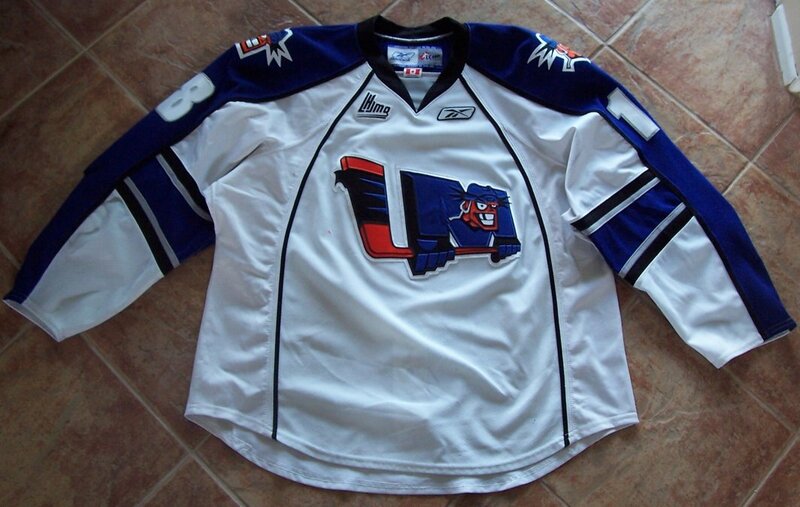 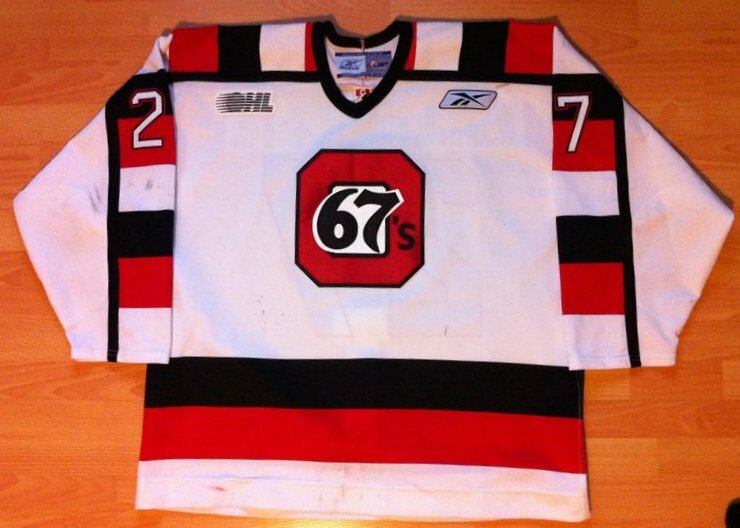 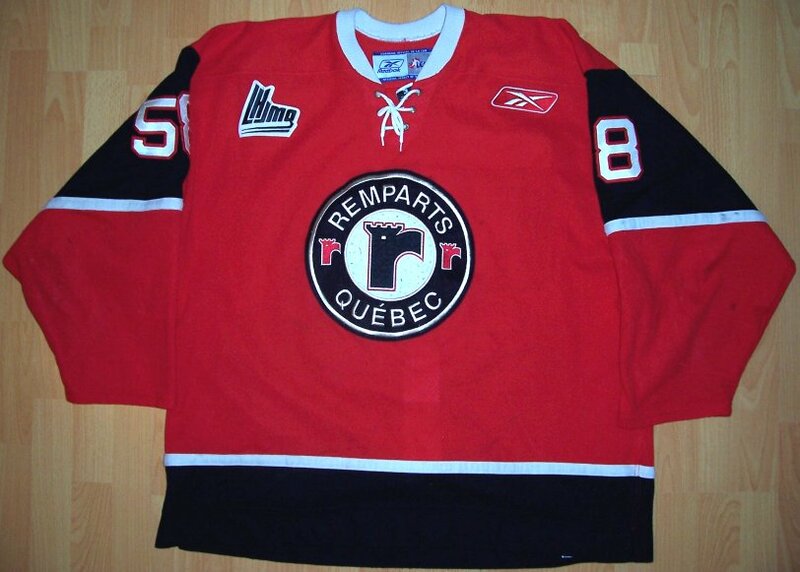 Made by Reebok, these size 58 hockey jerseys comes from the Quebec Remparts of the QJMHL. 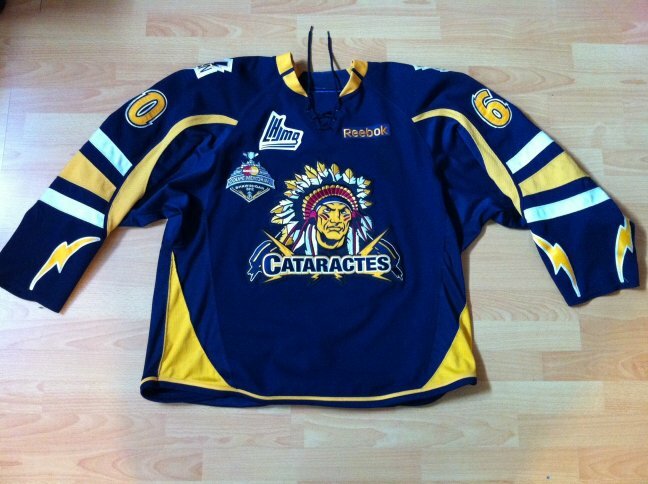 I bought them directly in l'Imaginaire (aka Cartes et timbres Ste-Foy) store in Quebec City (Merci!). 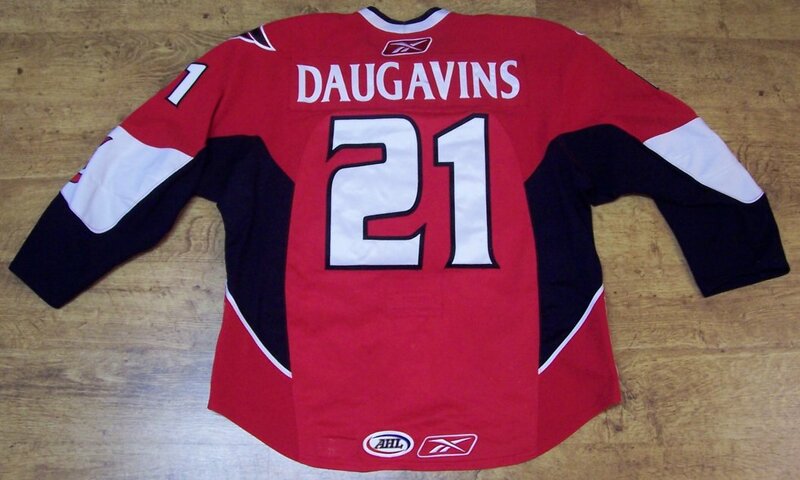 Everything is sewn on. 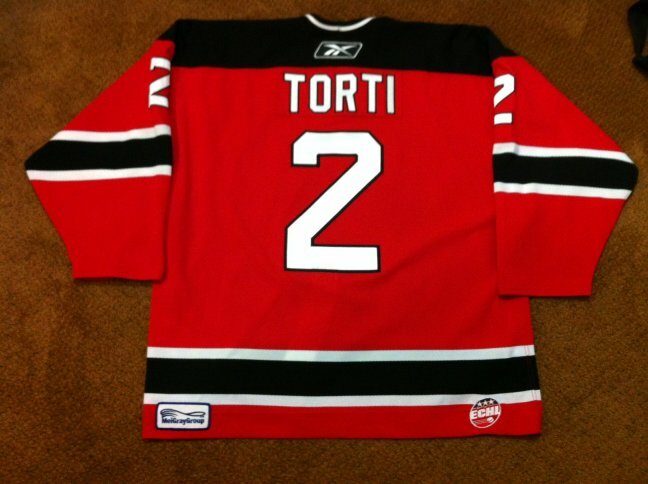 The Nameplates are re-attached to the jerseys. 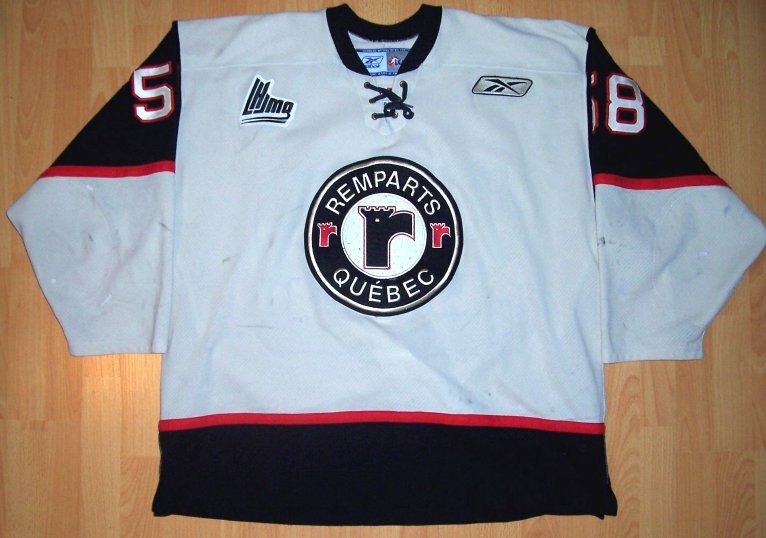 in 2005-06, Maxime plays for the Rimouski Oceanic which he's currently their top scorer. 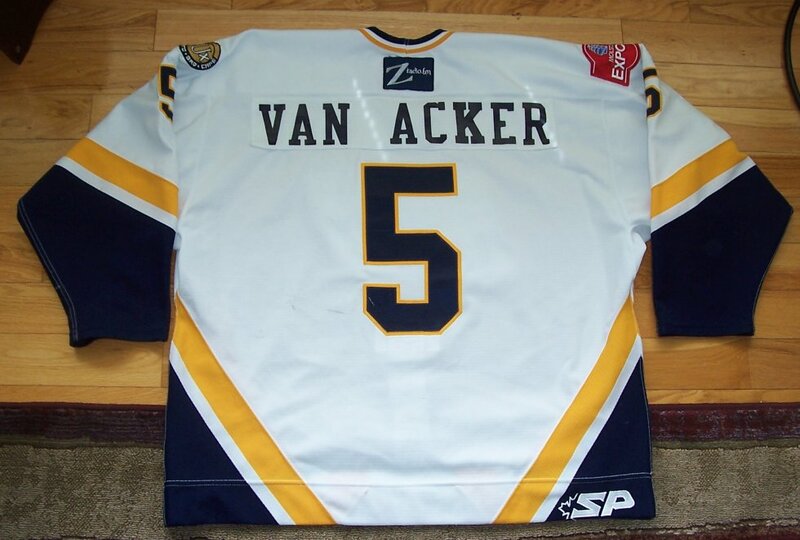 There are lots of stick/board marks, repaired cuts, some of pilling....great use all around! 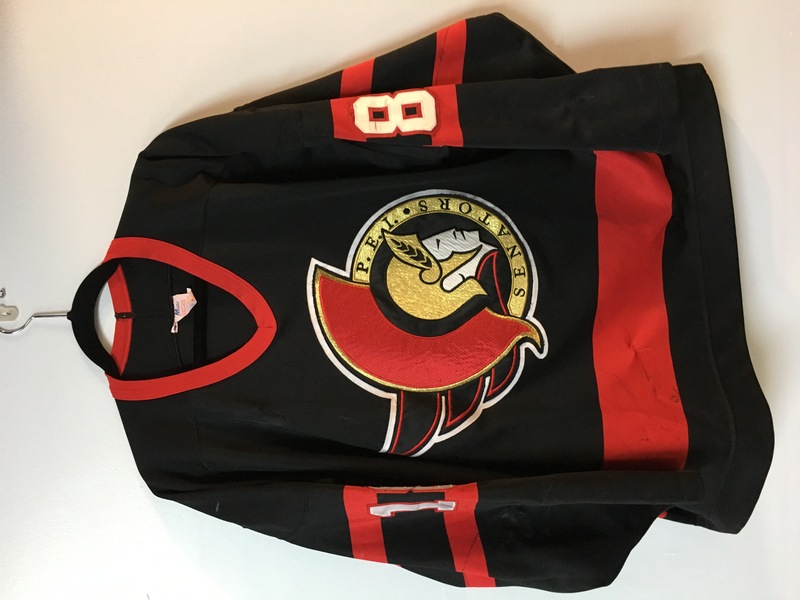 The Beige one has a hole in the logo. 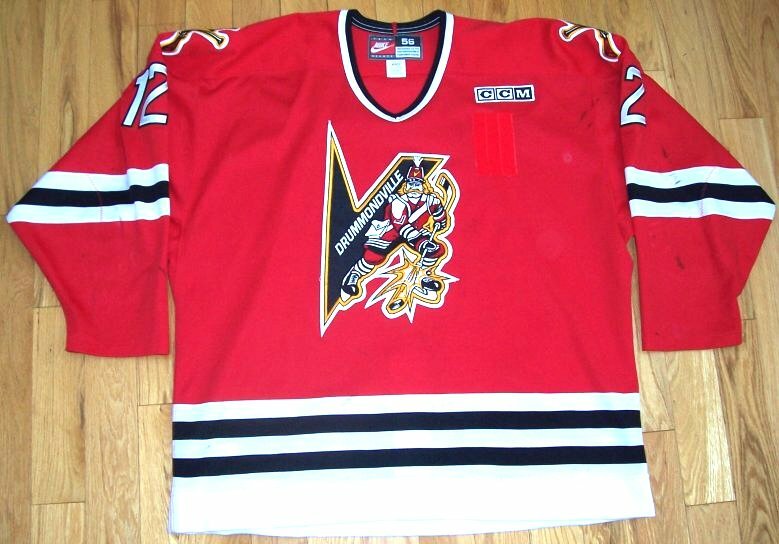 The Red one has a 7-inch unrepaired cut/hole. 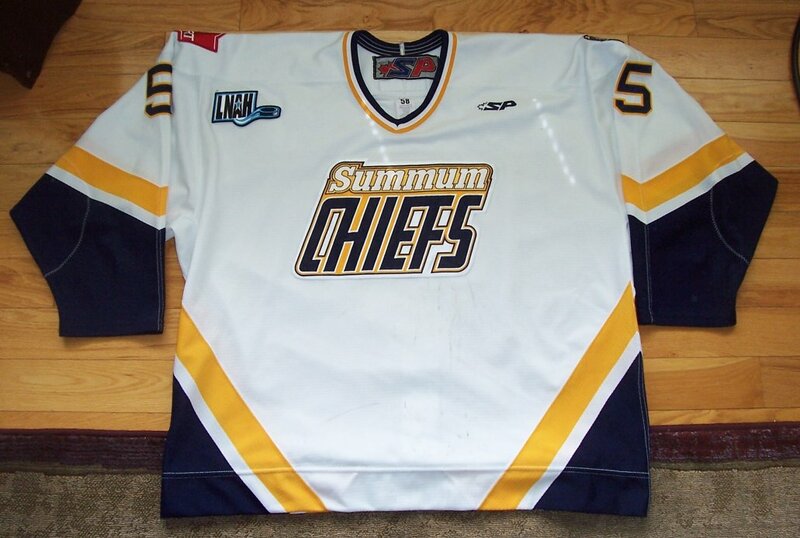 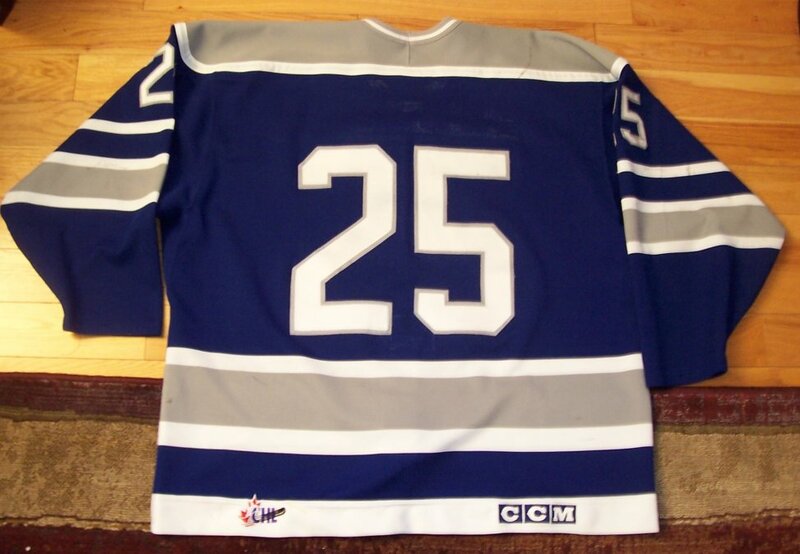 Made by CCM, This size 56 hockey jersey comes from the Hull Olympiques of the QJMHL. 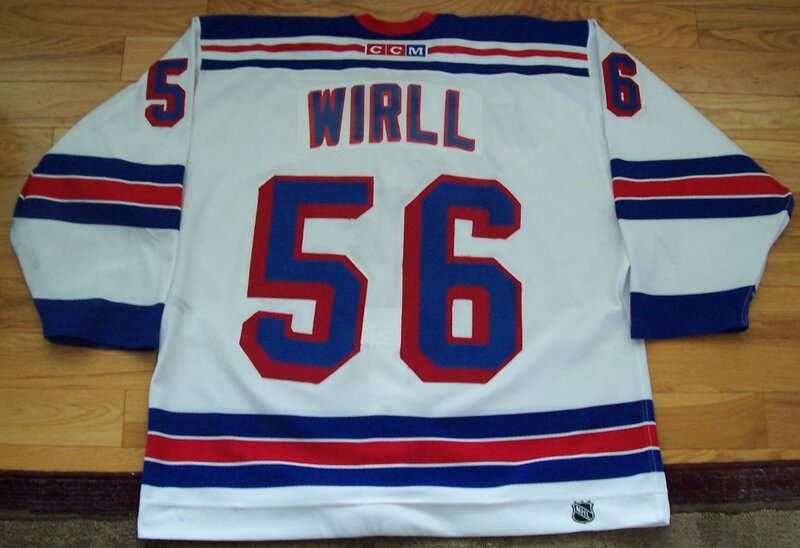 I got this from Milt Byron (Thanks Milt!). 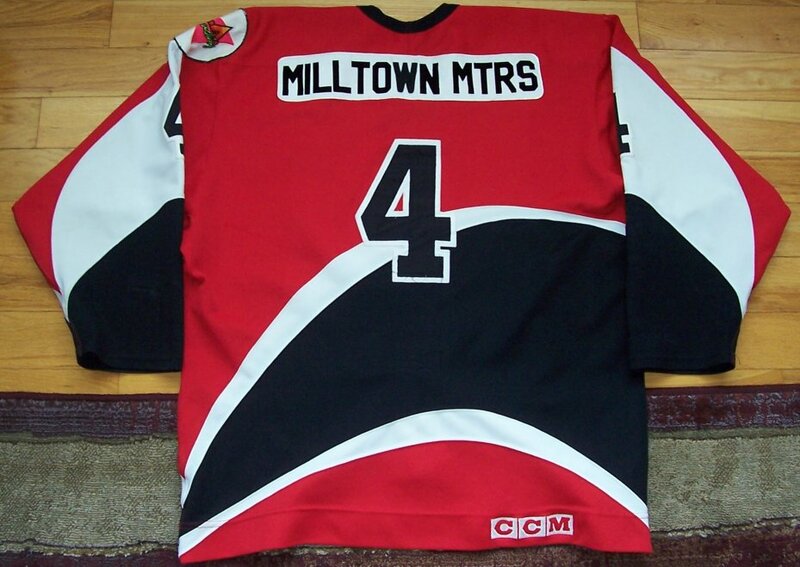 Logo is screened on. 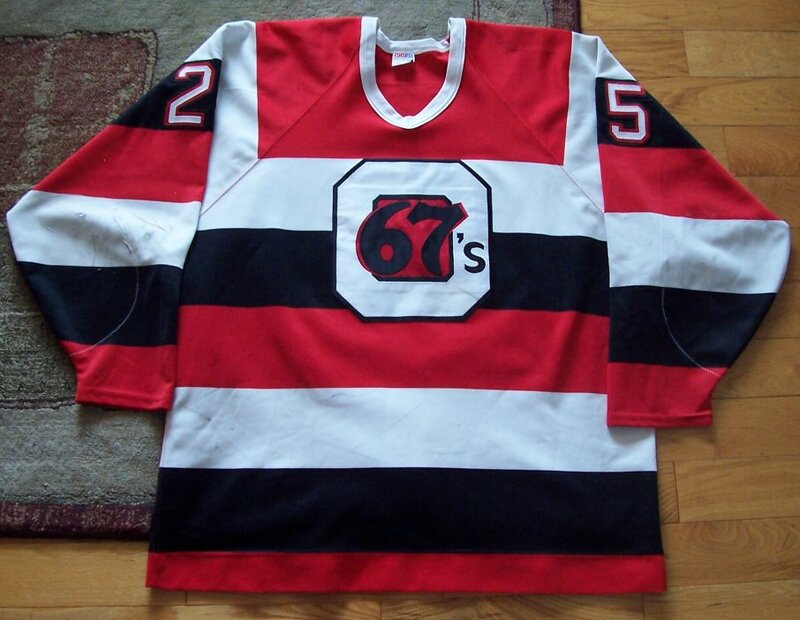 Numbers, 25th ann. 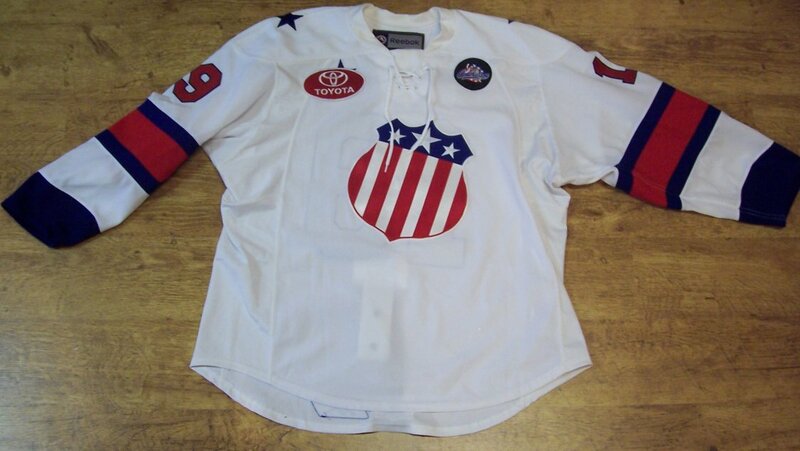 patch and 'A' on the front are sewn on. 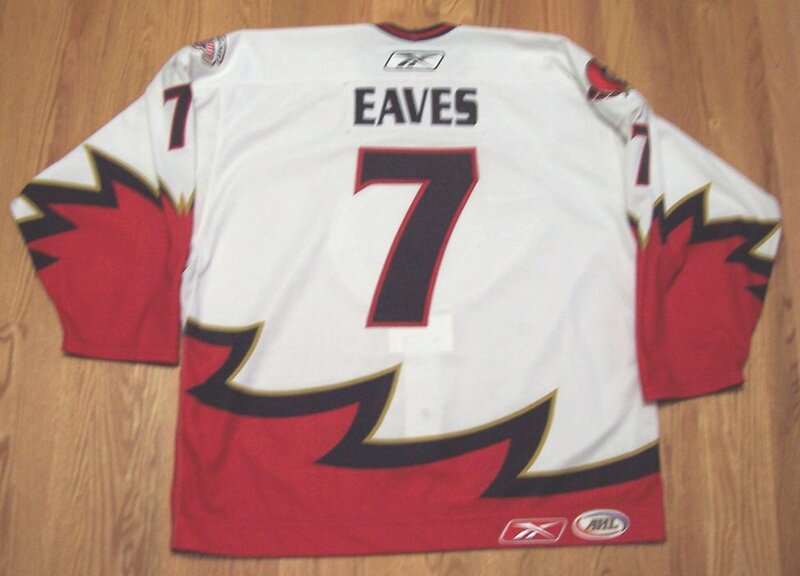 Name is heat-sealed on nameplete which is sewn on. 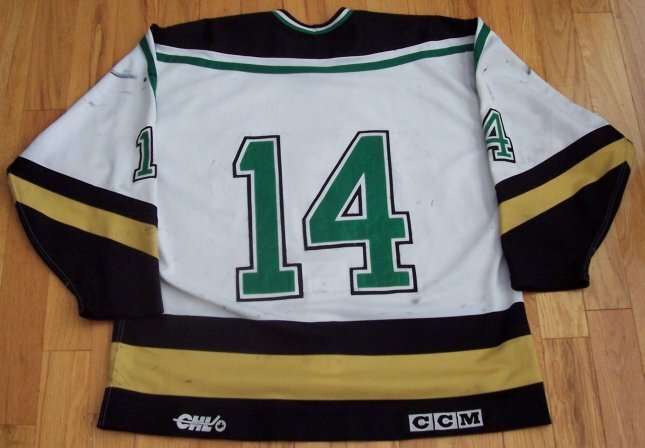 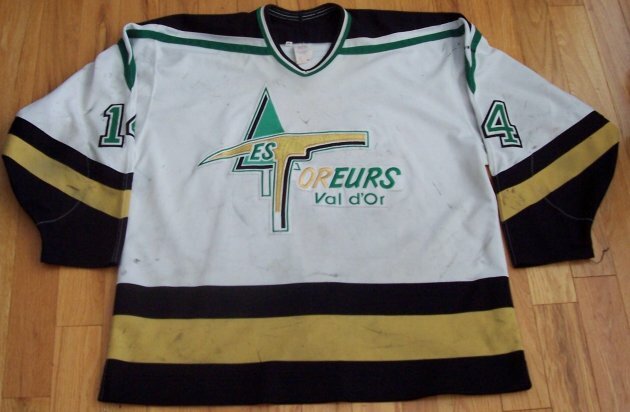 Made by CCM, This size 54 hockey jersey comes from the Val d'Or Foreurs of the QJMHL. 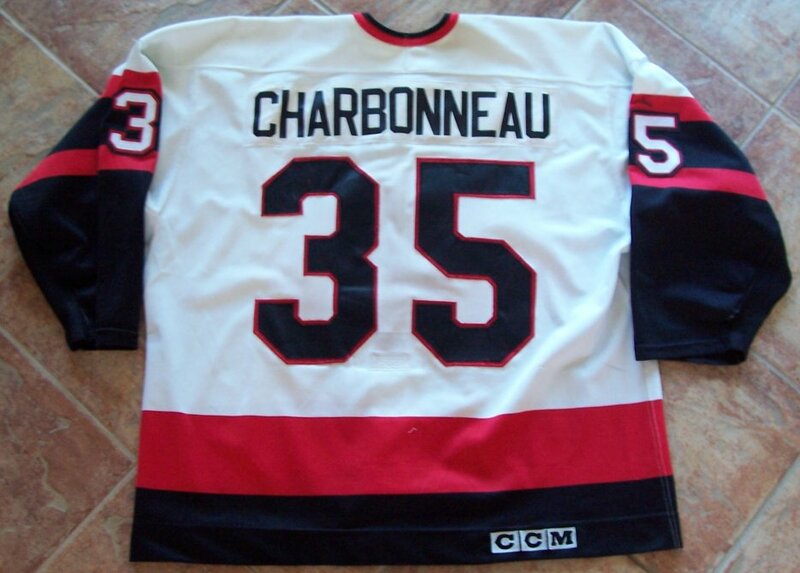 Nameplate was removed and is missing, but you can see the 'Chiasson' letters outlined on the shirt. 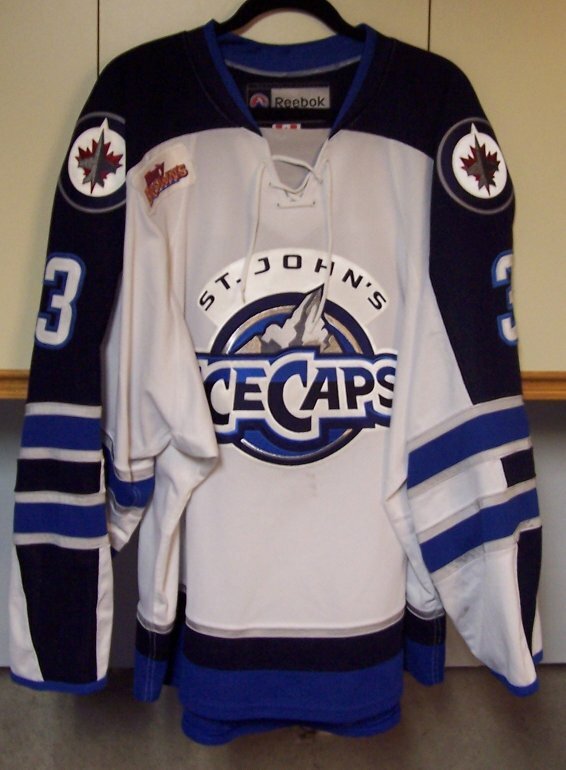 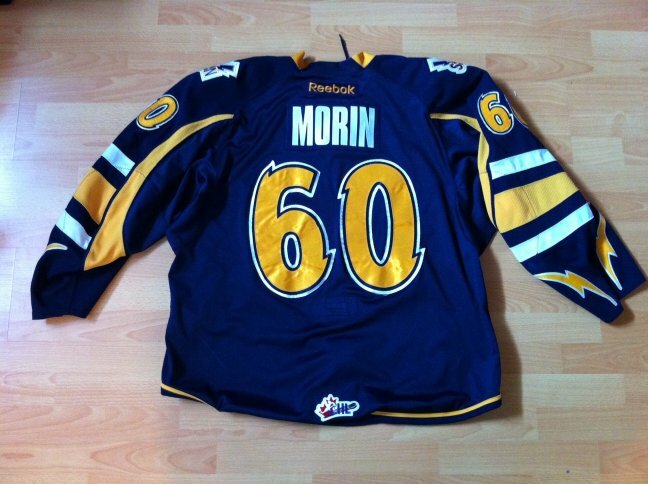 Made by SP, This size 58 hockey jersey comes from the Manitoba Moose of the AHL. 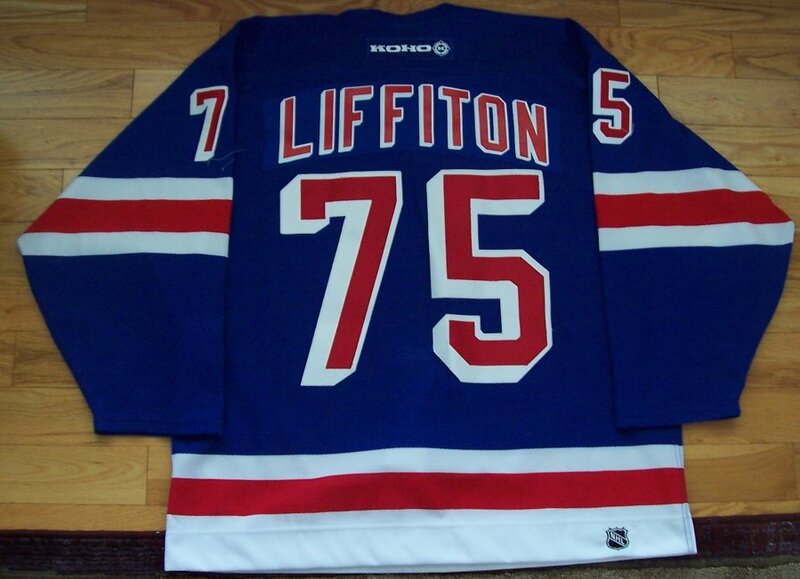 I got this through Pat Lelliot (Thanks Pat!). 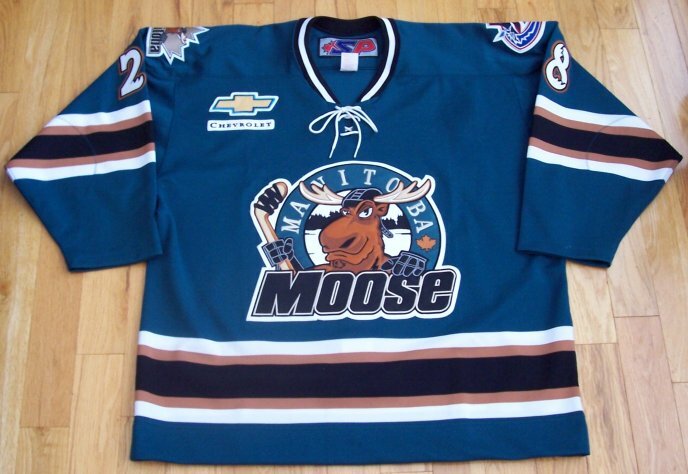 This is the final set of Moose jerseys that SP has done. 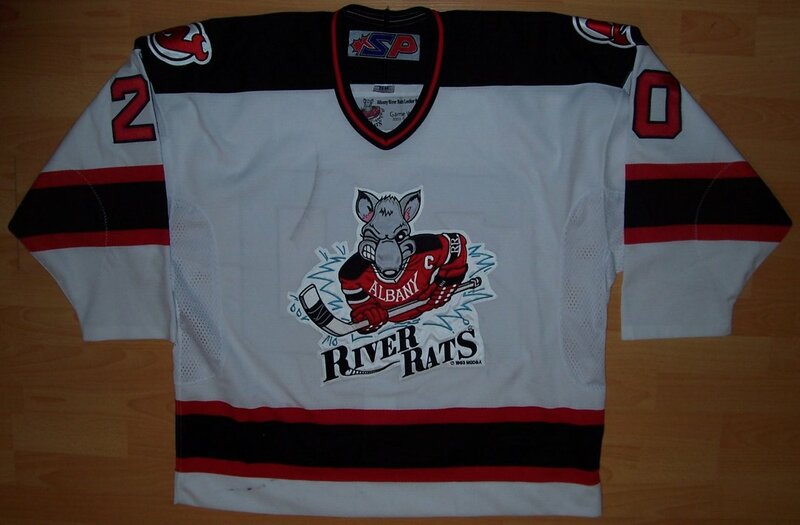 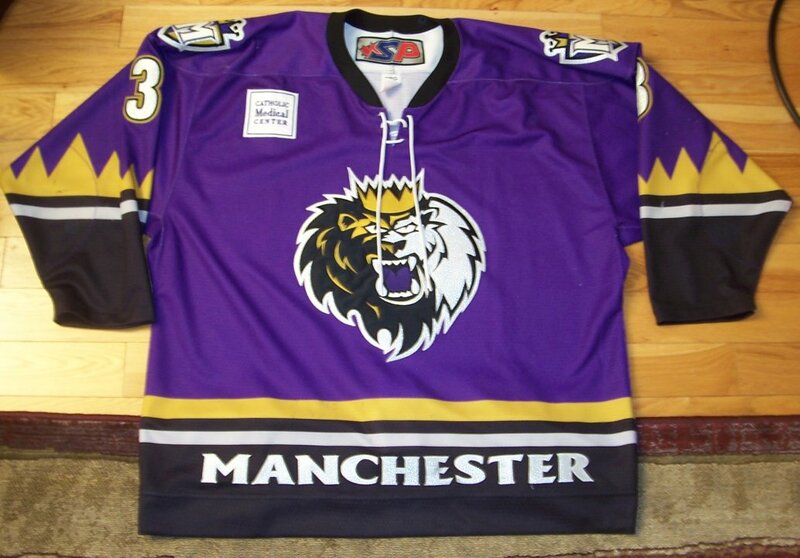 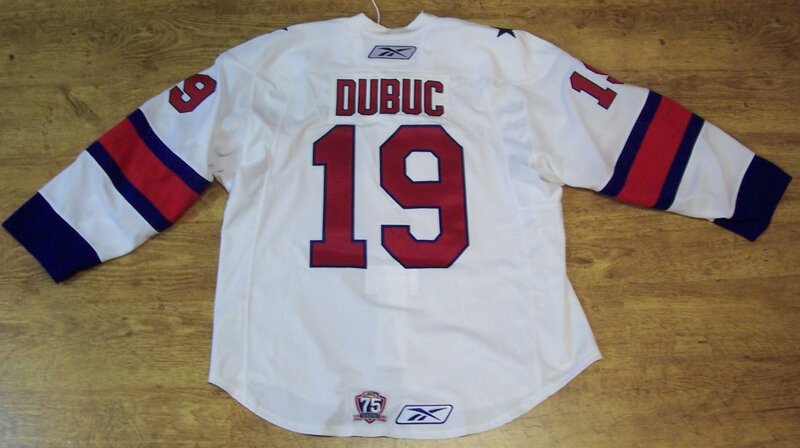 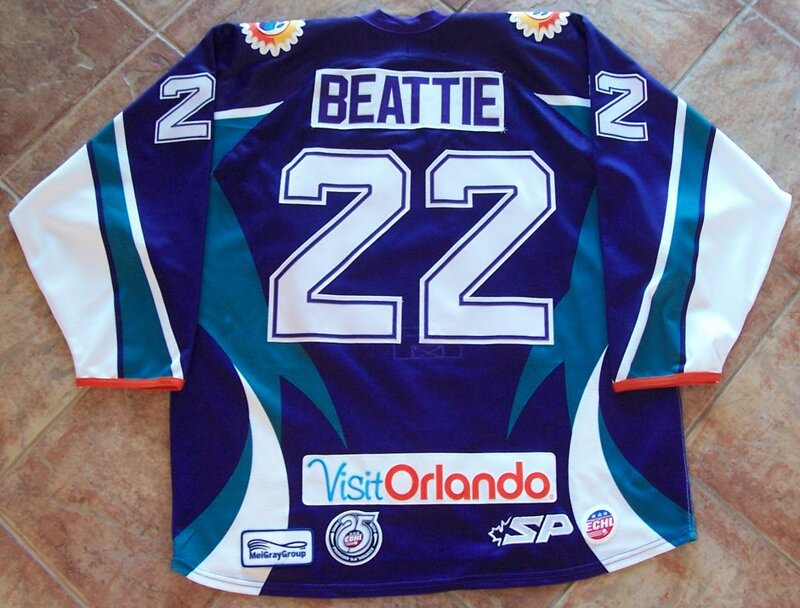 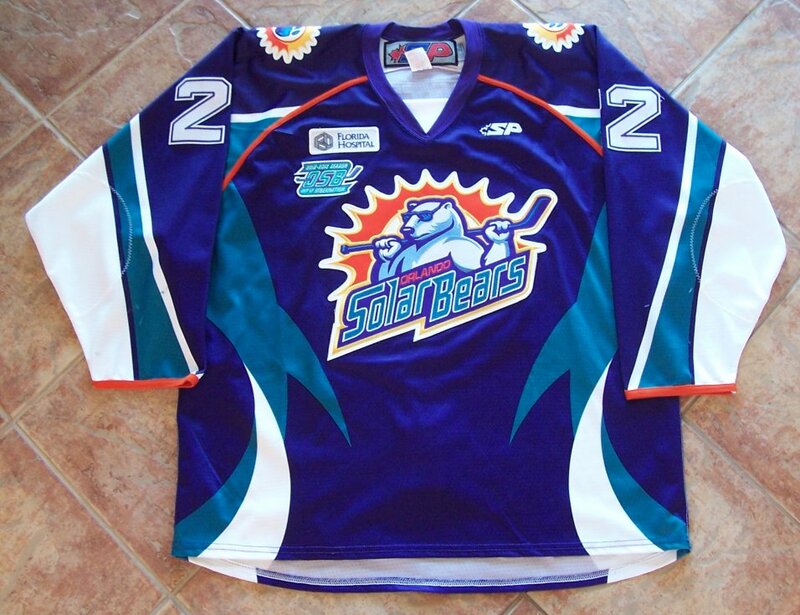 Great style, great customization, great logo...just a GREAT JERSEY! 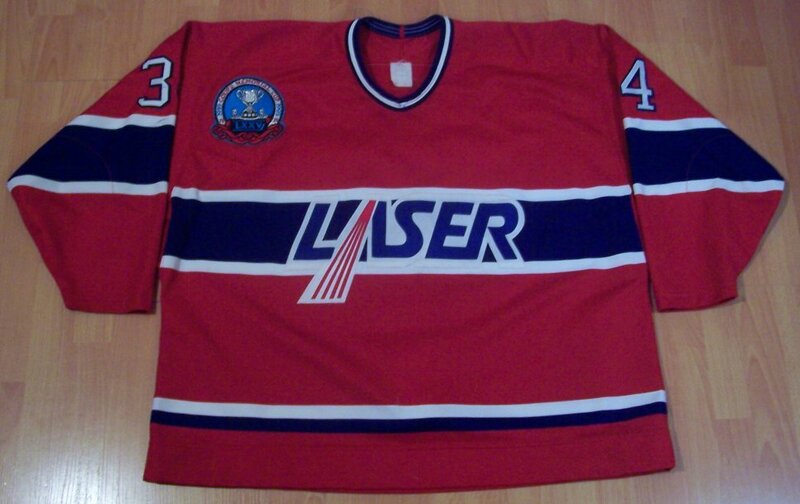 Made by Bauer, This size 54 hockey jersey comes from the now-defunct Sturgeon Falls Lynx of the NOJHL. 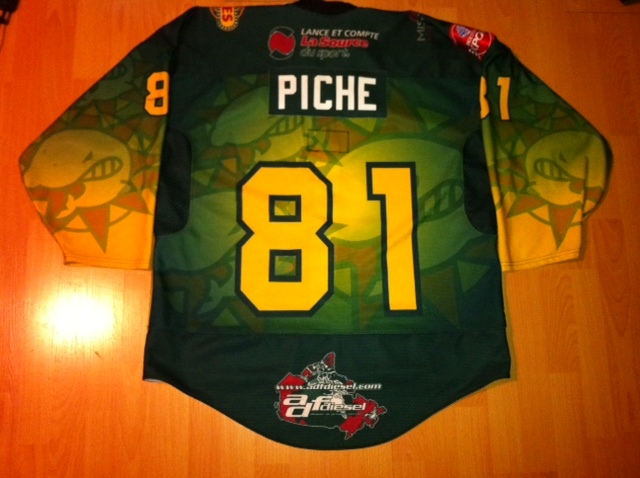 I got this from Eric. 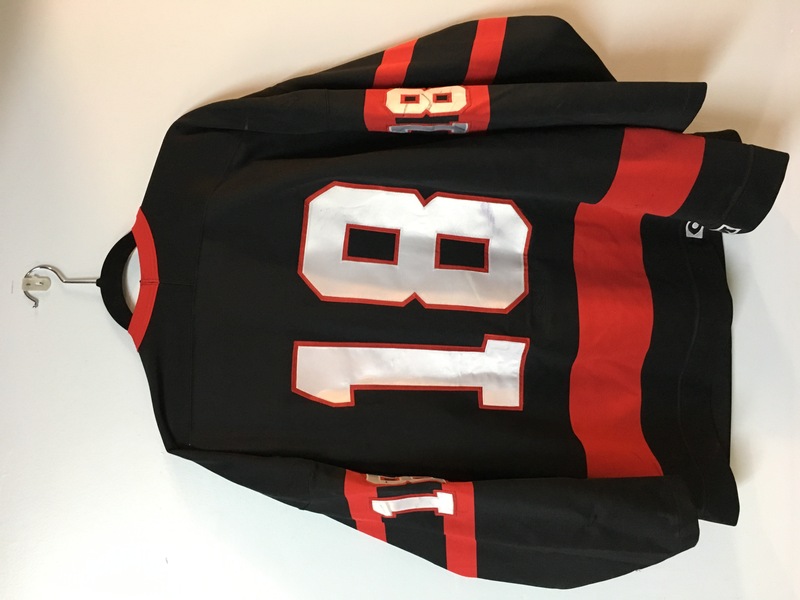 Thanks Eric! 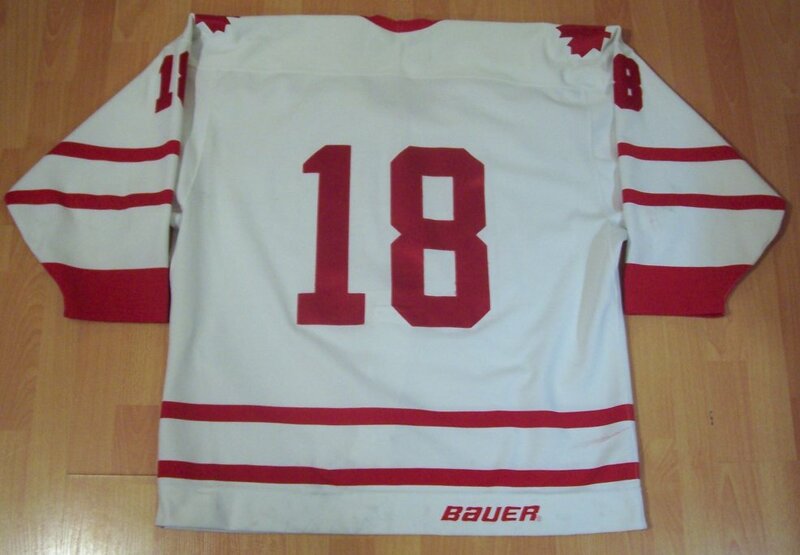 Everything is sewn on. 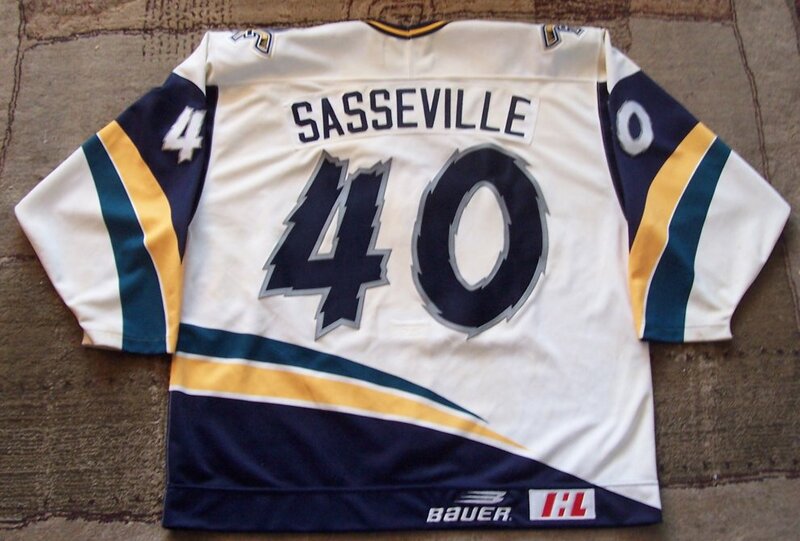 It doesn't show any sign of a nameplate. 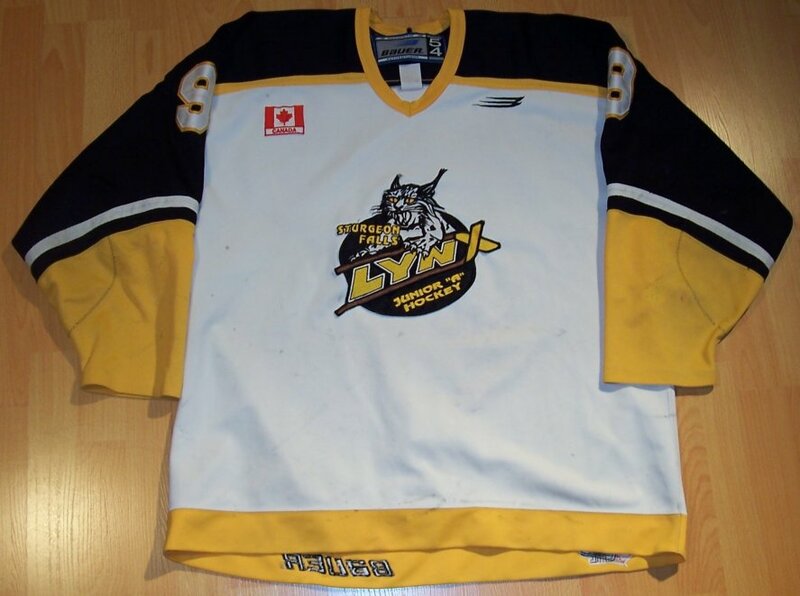 The Lynx were the farm team of the now-defunct North Bay Centennials of the OHL. 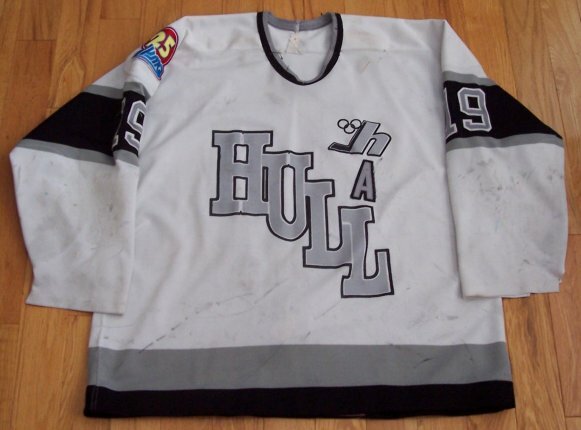 There are some stick marks, many repairs, and lots of pilling. 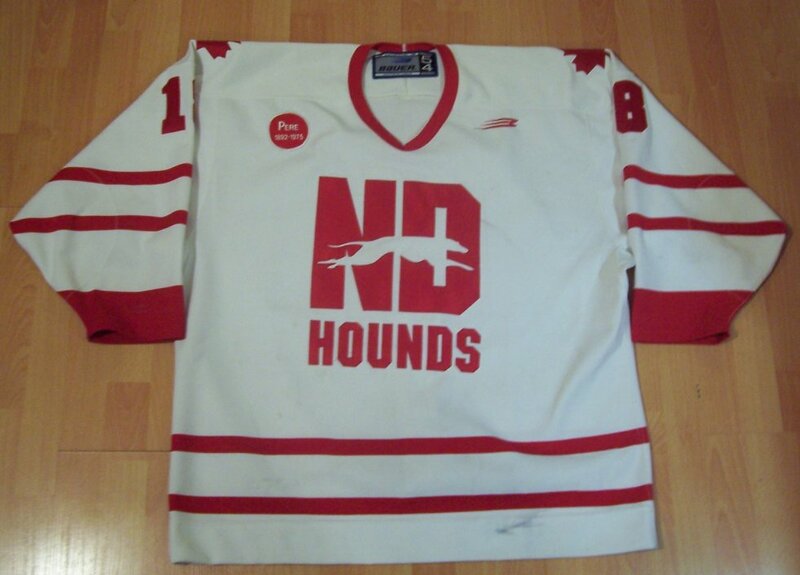 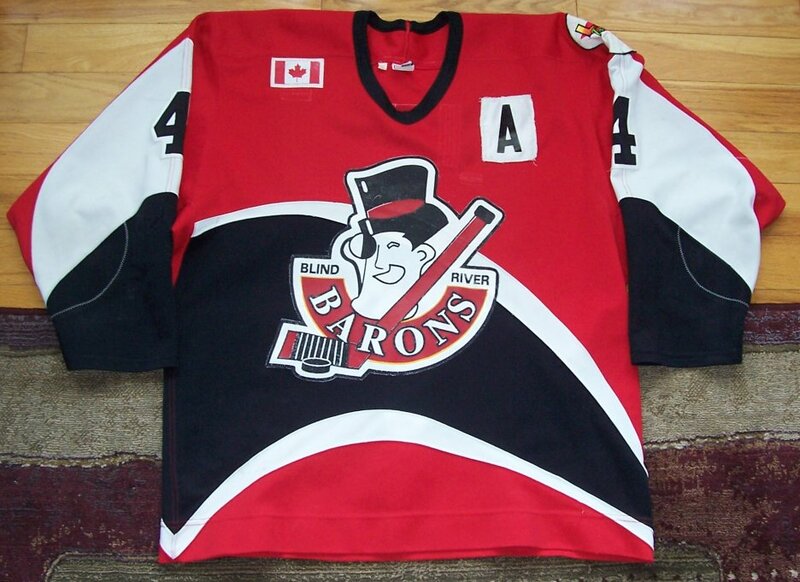 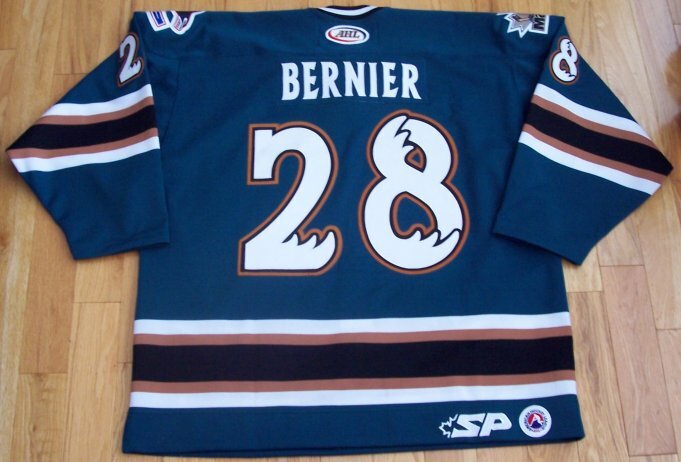 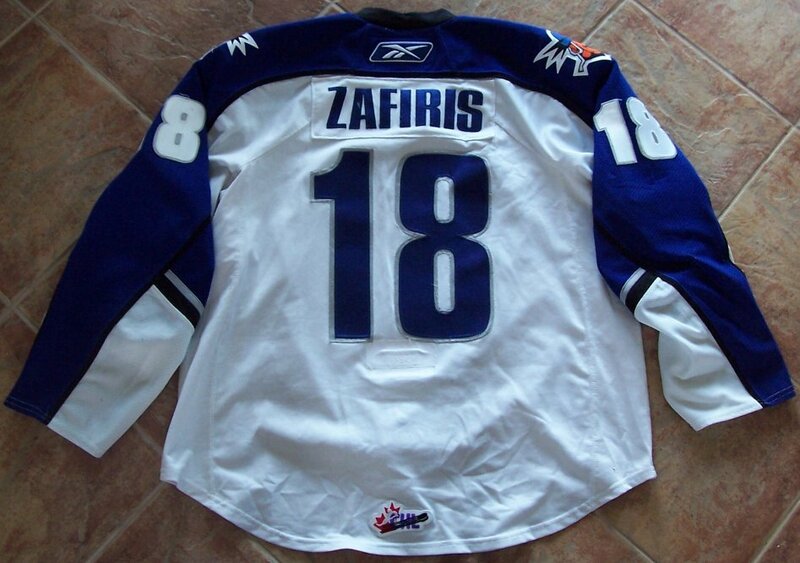 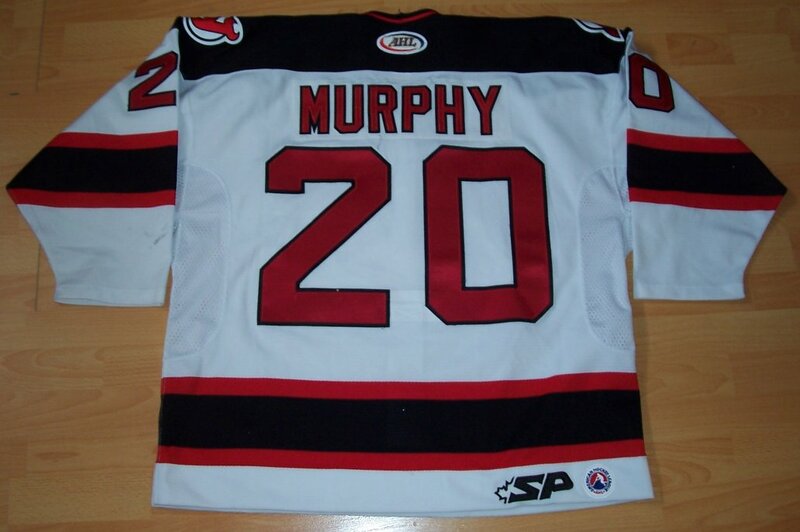 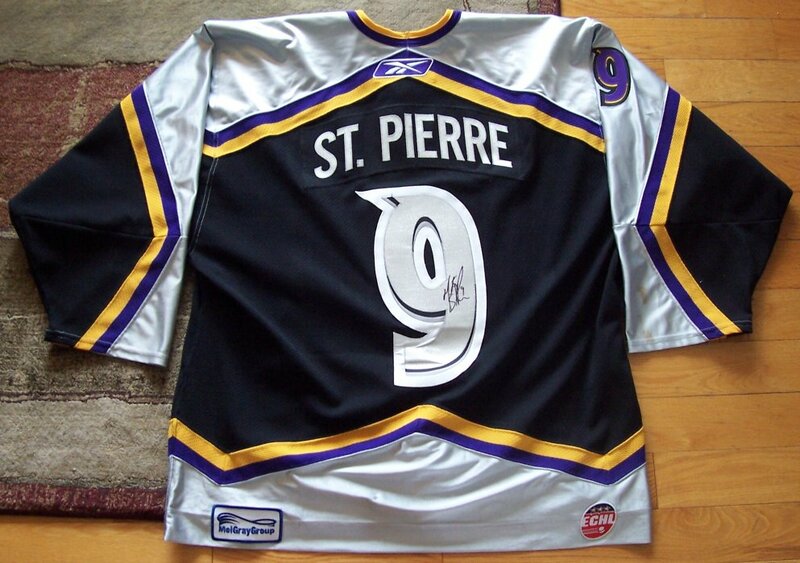 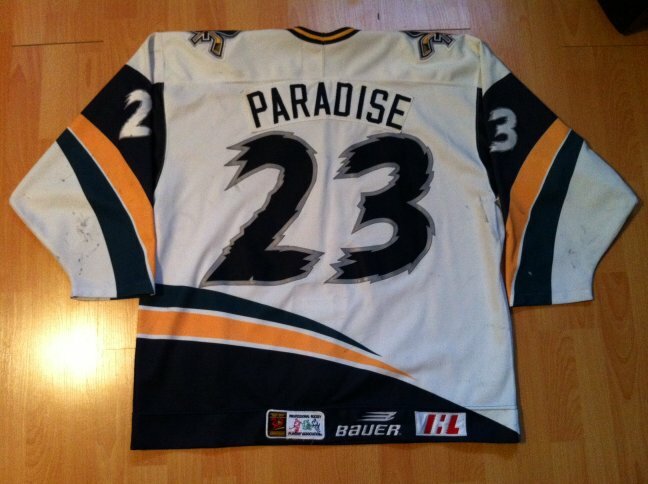 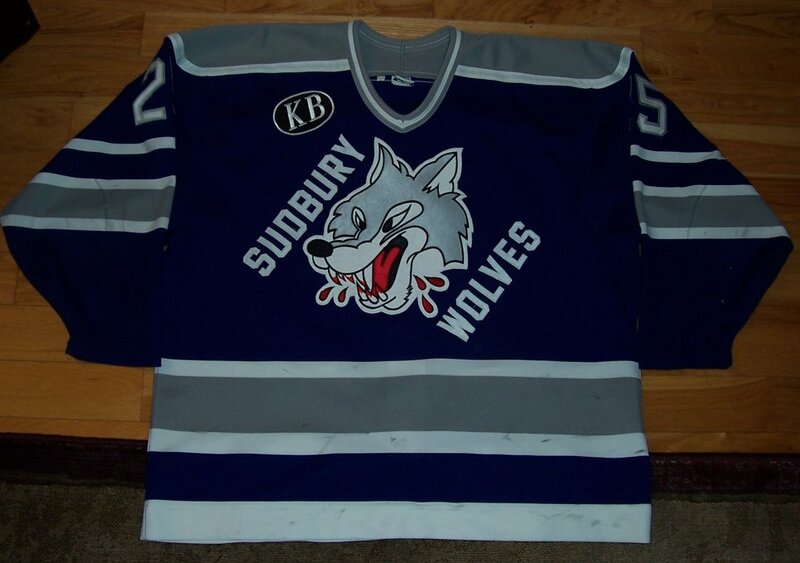 This jersey was purchased as a fond reminder of my years living in the North Bay-Sturgeon Falls area. 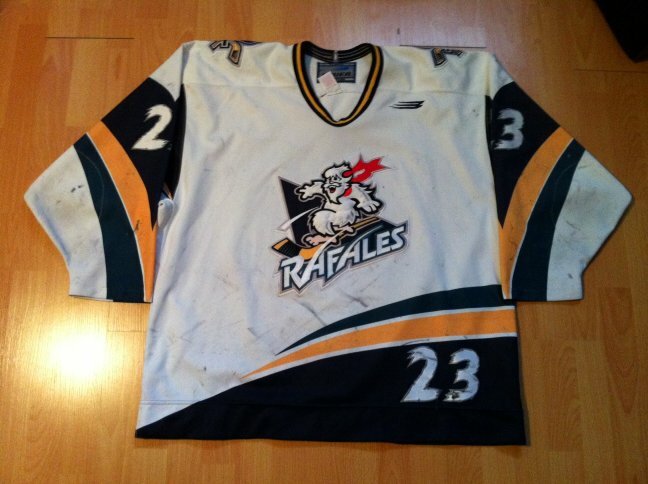 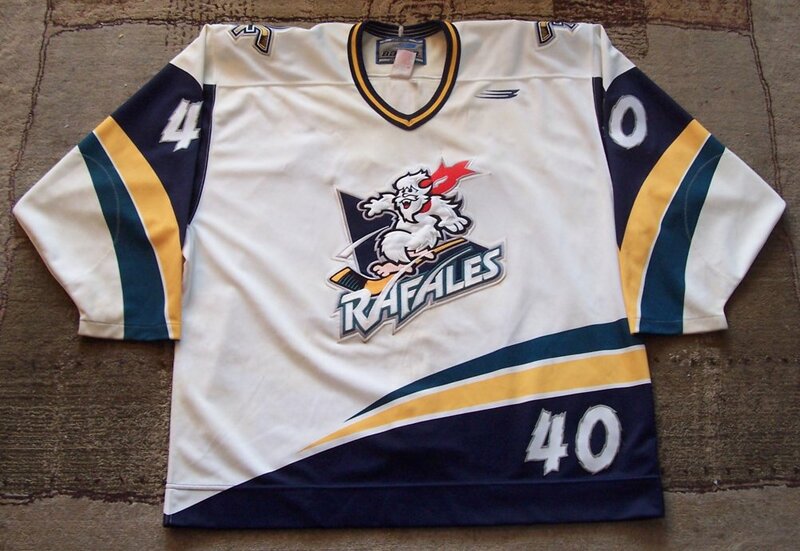 Made by Bauer, This size 56 hockey jersey comes from the defunct Quebec Rafales of the defunct IHL. 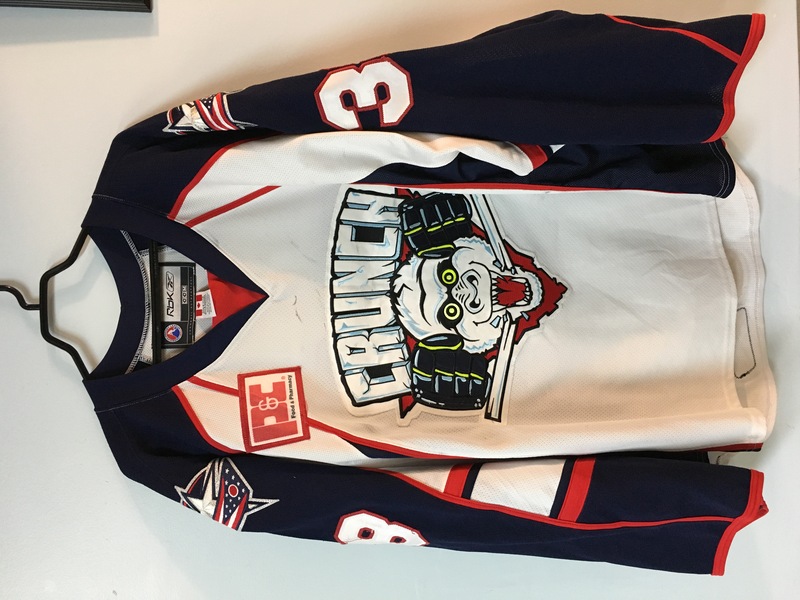 I got this through a forum. 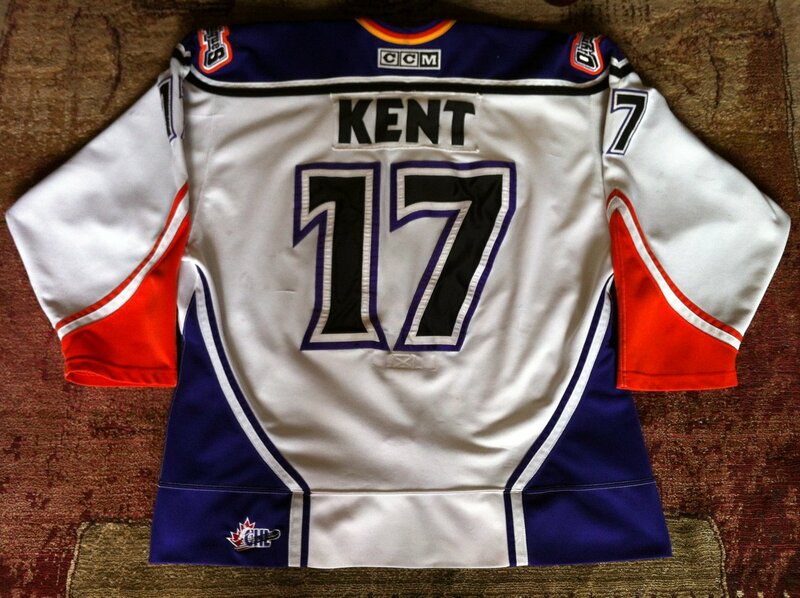 Thanks Brent! 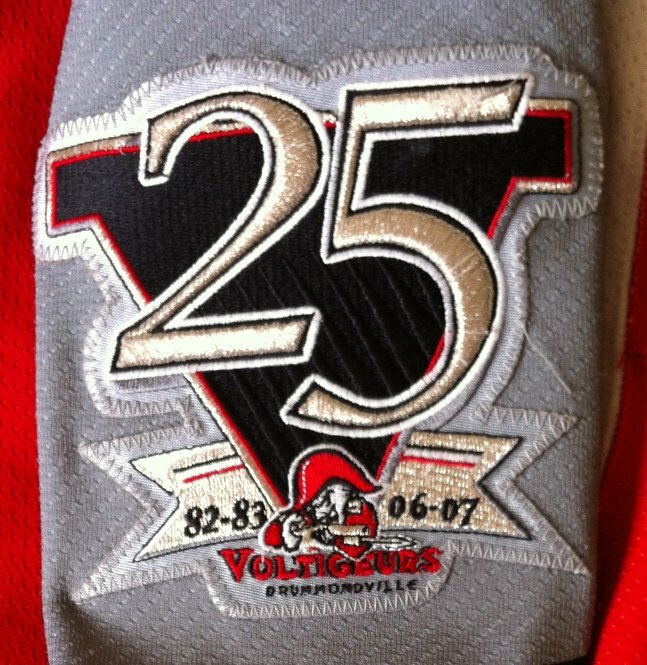 Everything is sewn on. 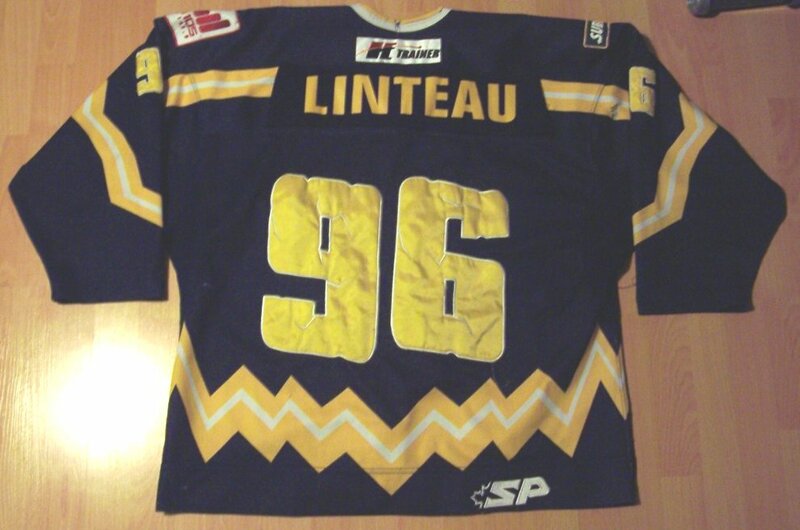 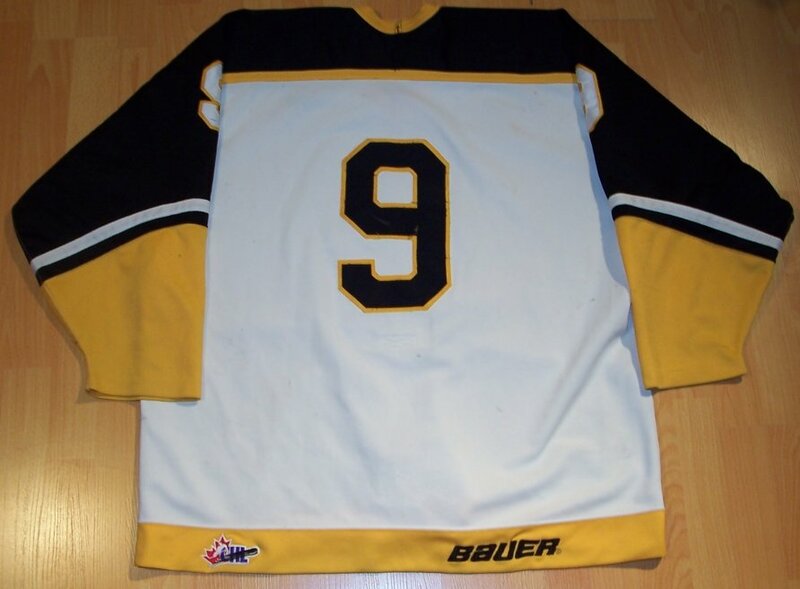 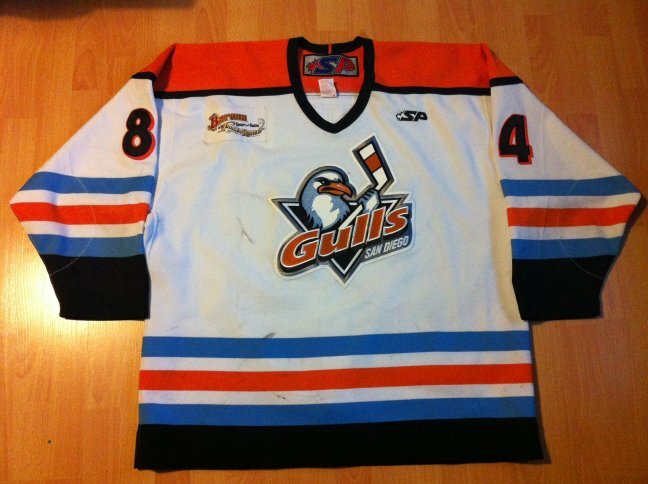 There's no sign of wear or nameplate, thus this jersey is 'team issued'. 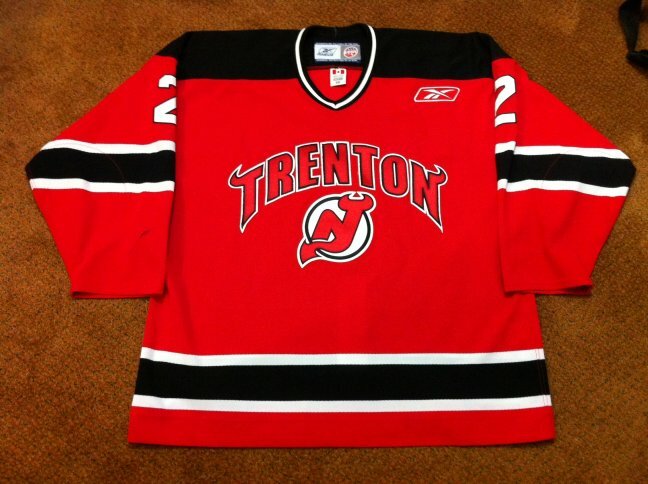 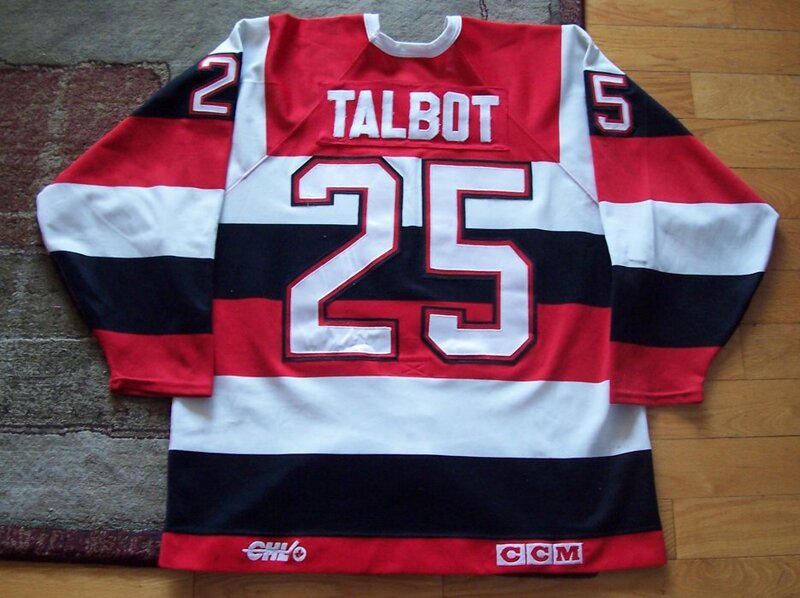 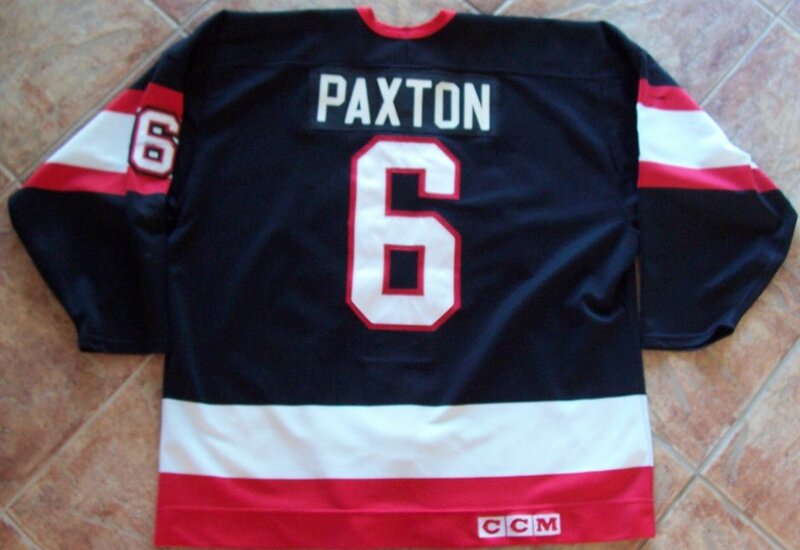 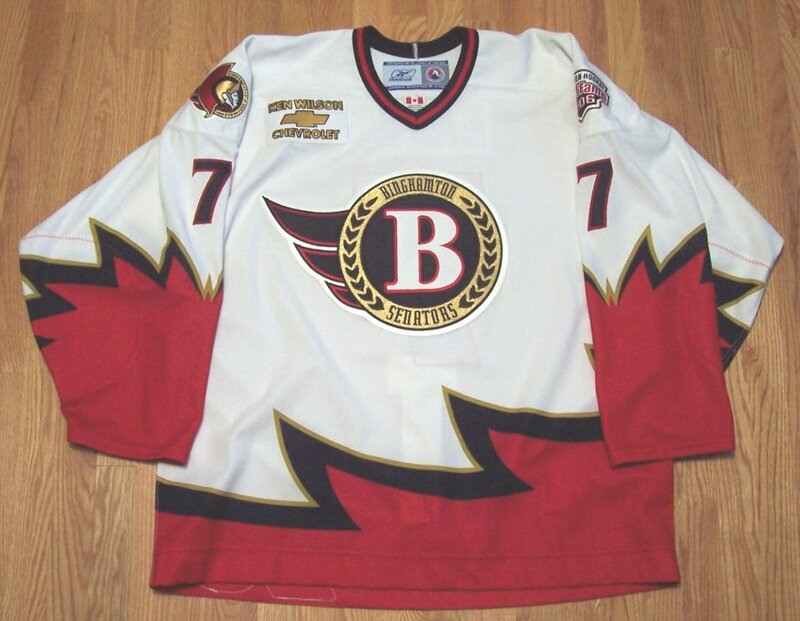 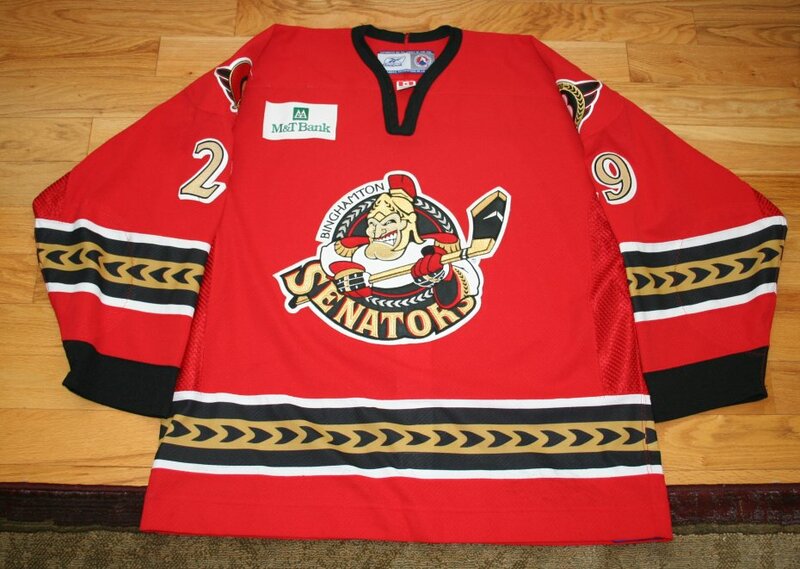 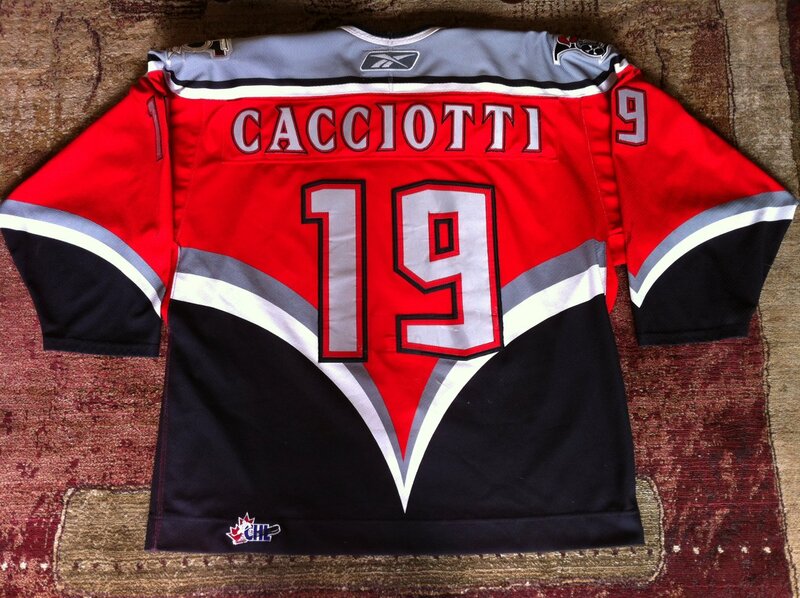 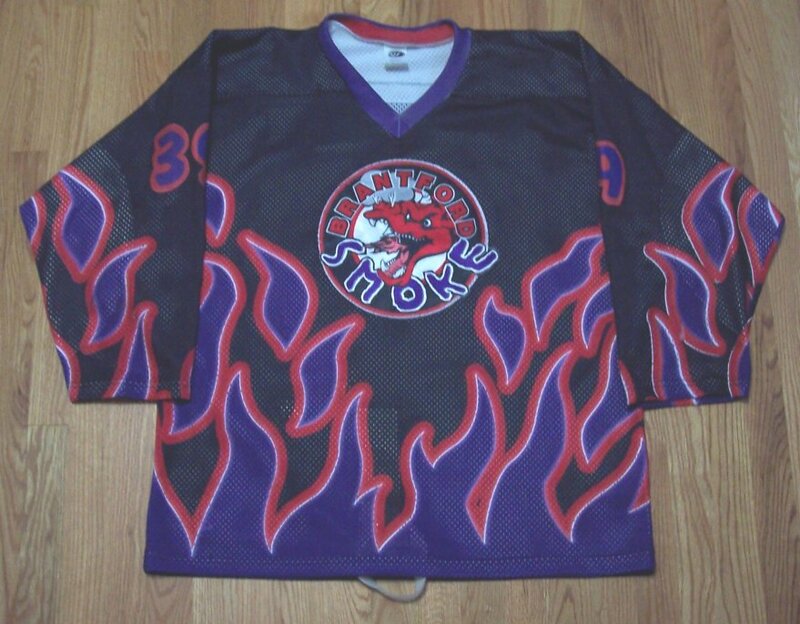 Made by Reebok, This size 58 hockey jersey comes from the Binghamton Senators of the AHL. 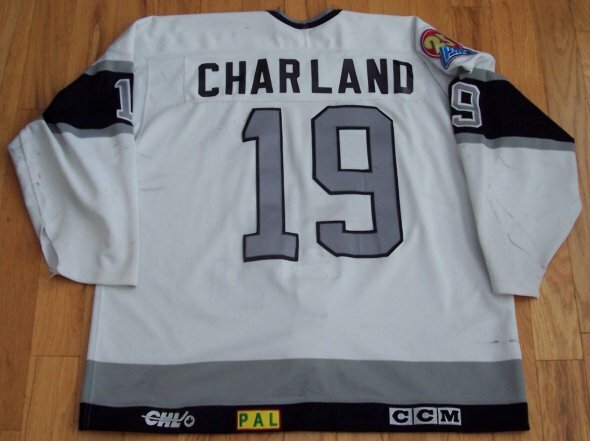 I got this at MeiGray....Thanks gang! 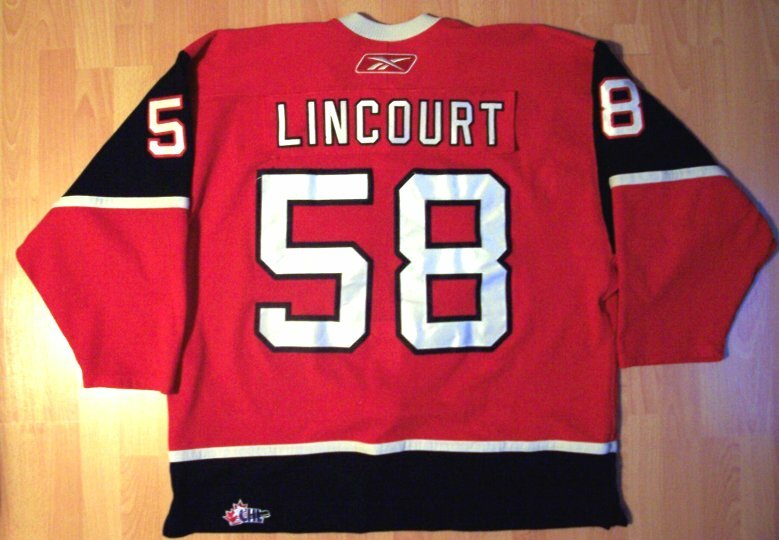 Everything is sewn on. 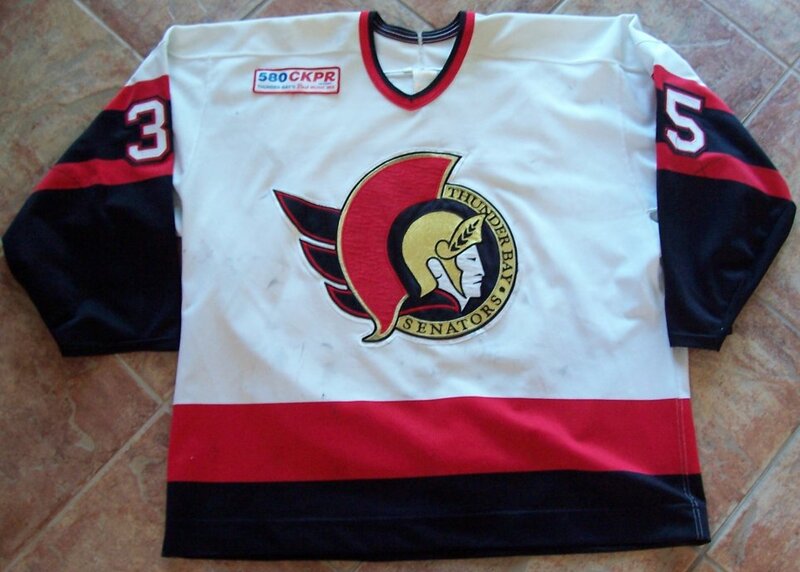 There are some nice marks on it...I just LOVE the colors, numbers and LOGO! 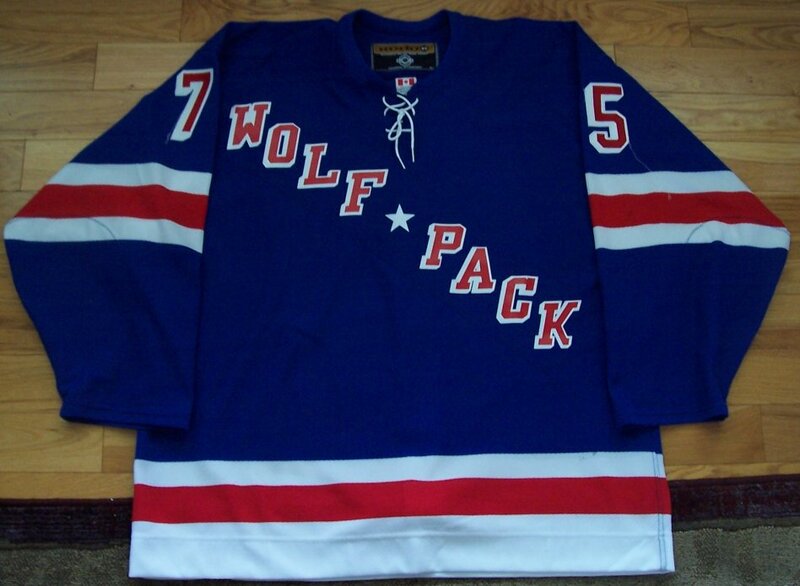 Made by CCM/Koho, these size 58 hockey jerseys comes from the AHL's Hartford Wolf Pack AND NHL's New York Rangers. 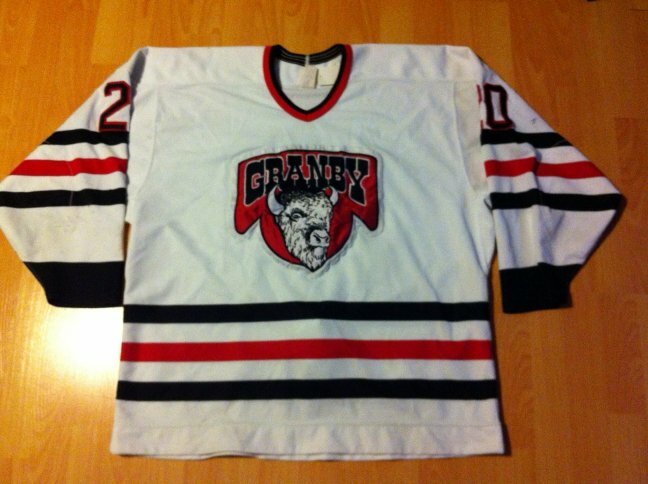 I bought these at MeiGray...Thanks gang! 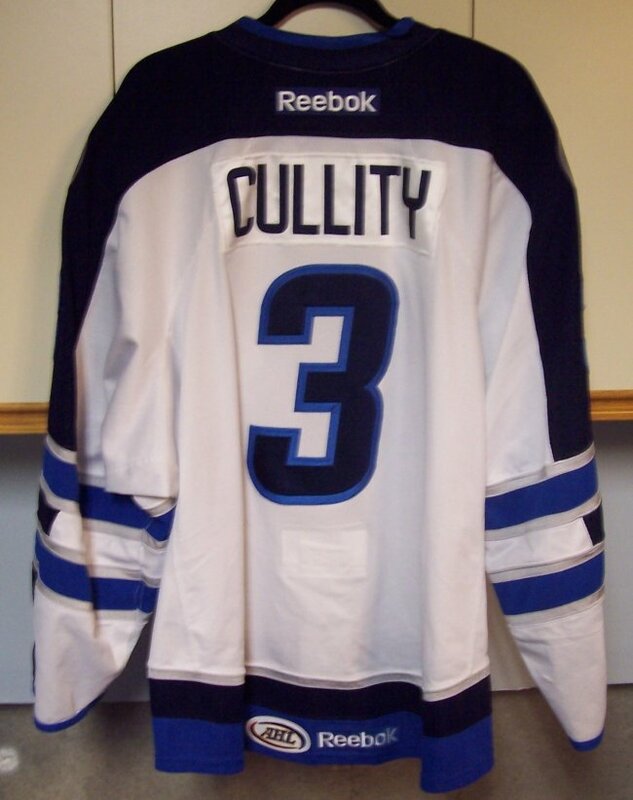 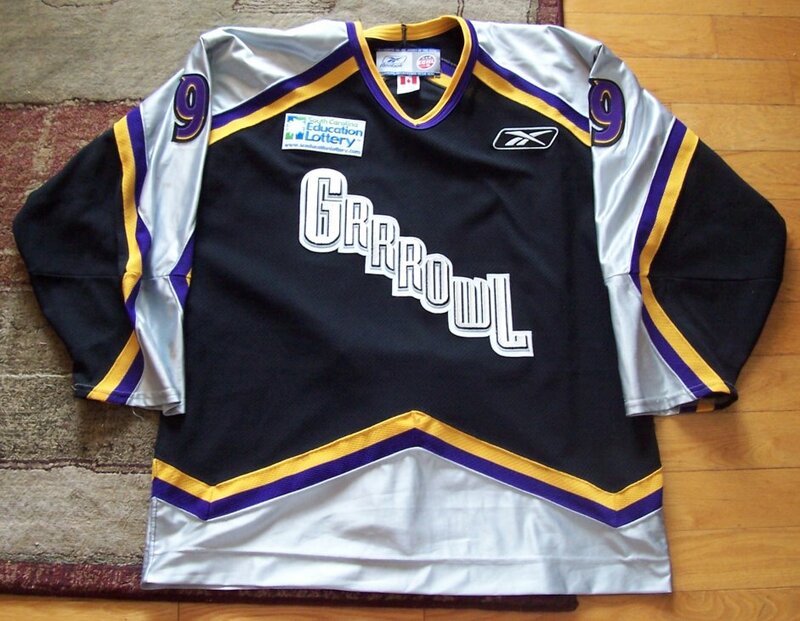 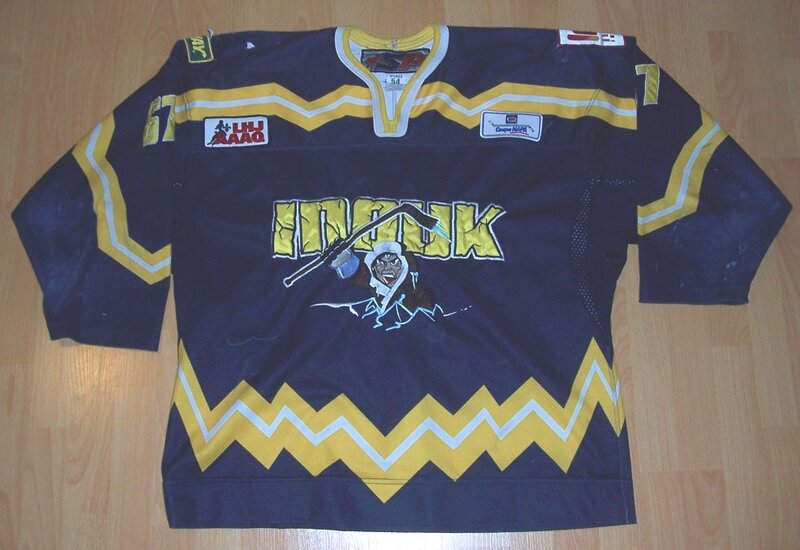 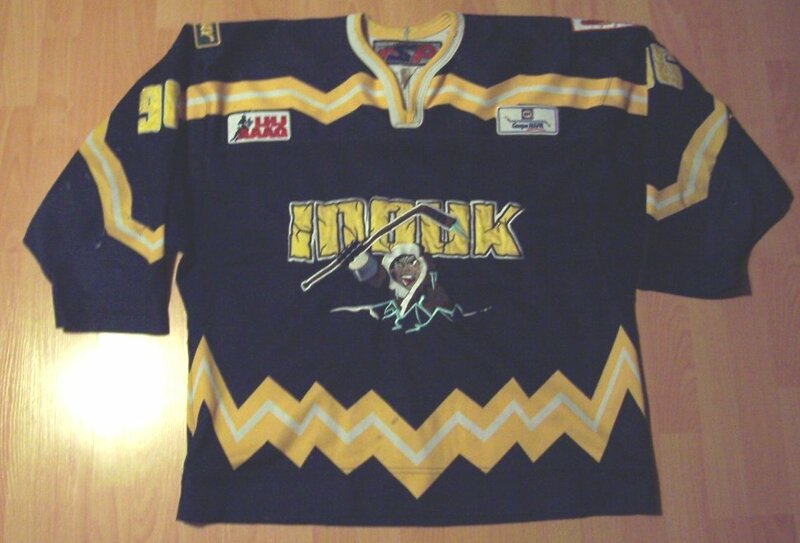 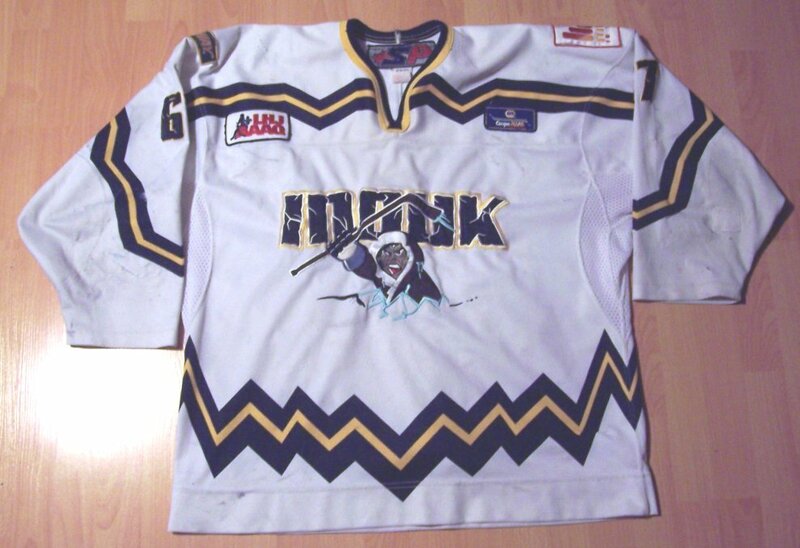 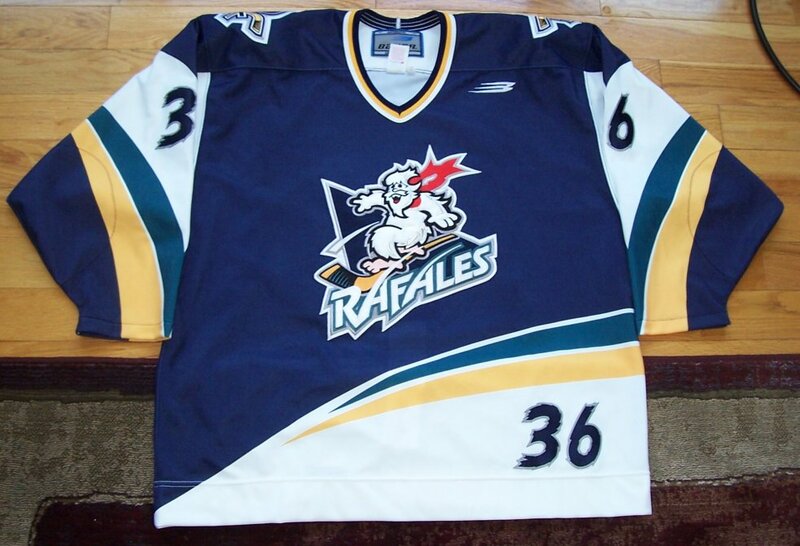 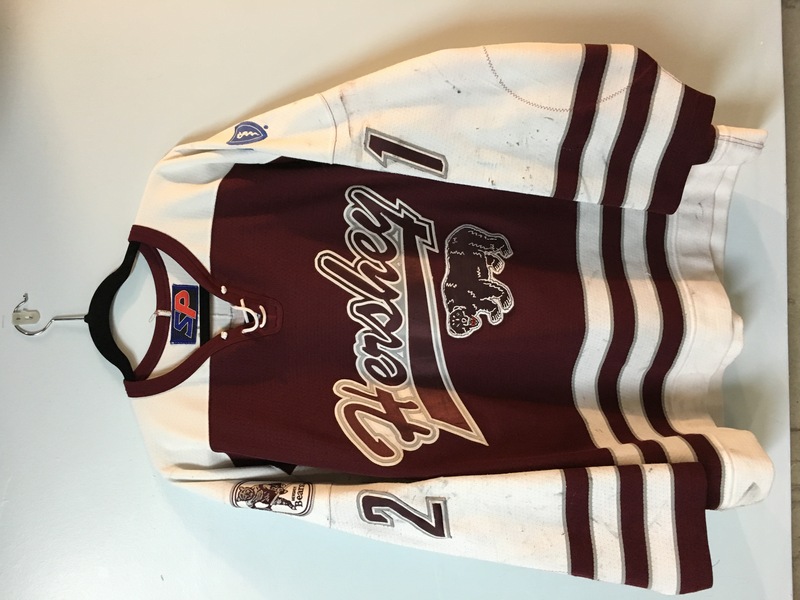 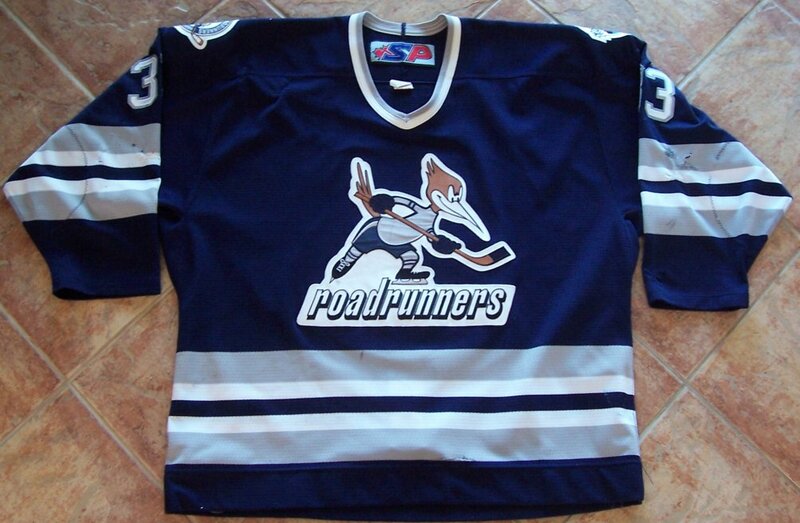 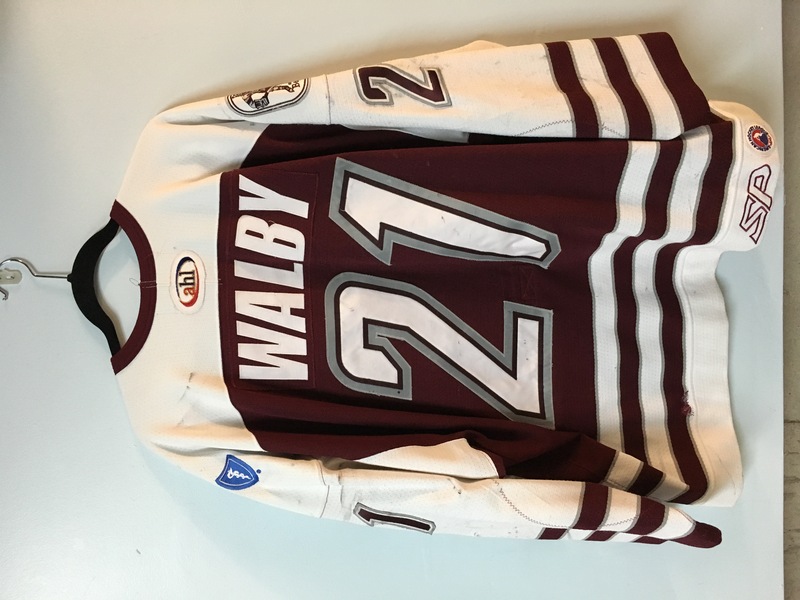 These jerseys were used for the 2004-05 pre-season games of the Wolf Pack as well as for the 2002 and 2003 pre-season games of the NY Rangers. 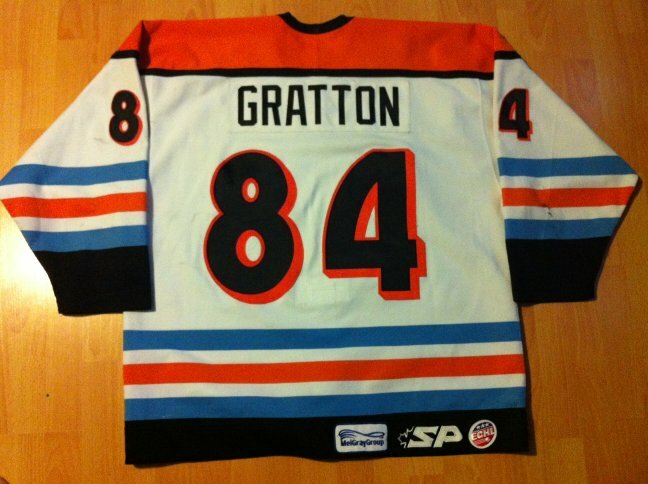 These were sold as 'Game issued' even though they show lots of wear from the Rangers pre-seasons. 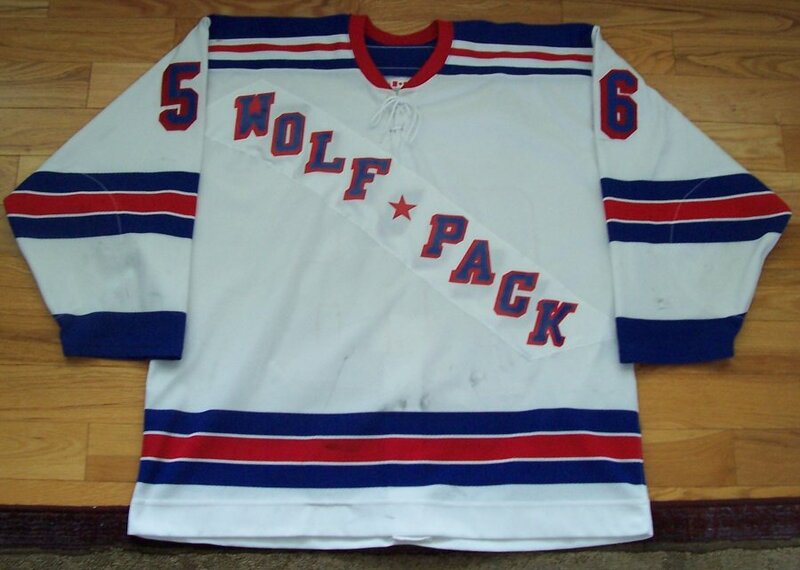 The name and the 'Wolf Pack' on the front are screened on the plates which are sewn on the jerseys.